The color blue is a calming color, one that inspires relaxation. It is often considered to be a masculine color but that’ just not the case. Bit men and women can embrace the color blue. Artists love the color blue because it’s striking as well as offers the calming effect that most artists create in. 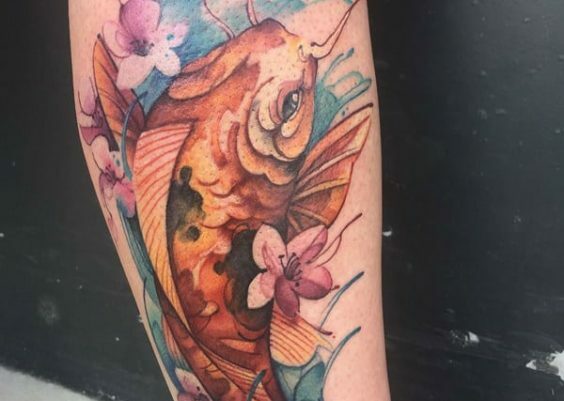 There is a lot of appeal to the color and there are a ton of tattoos that are great with the color. 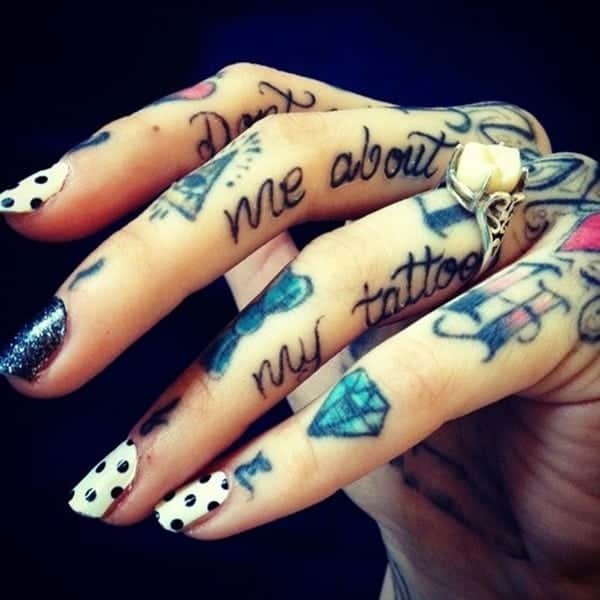 There are a ton of meaningful tattoos that are available for artists. There are so many in fact that you might have a hard time picking one. With this style, you get to see different transitions with the color. 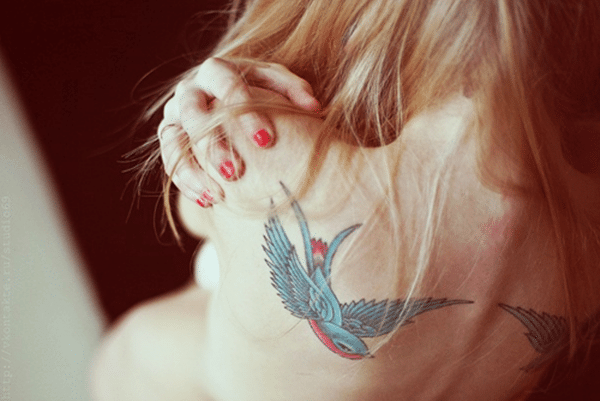 Bluebirds are beautiful creations and birds themselves hold a lot of meaning in the world. She has more than one of them on her back. 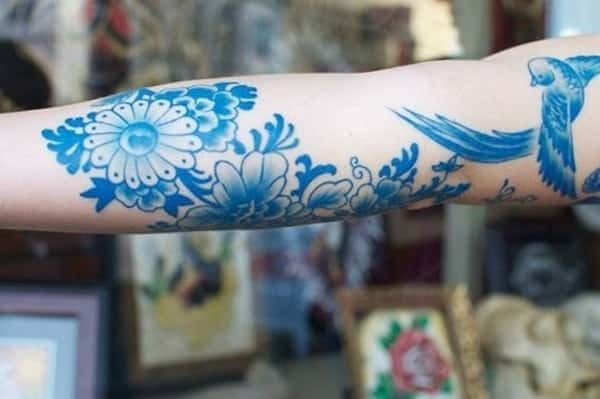 The color blue really makes this unusual tattoo stand out. 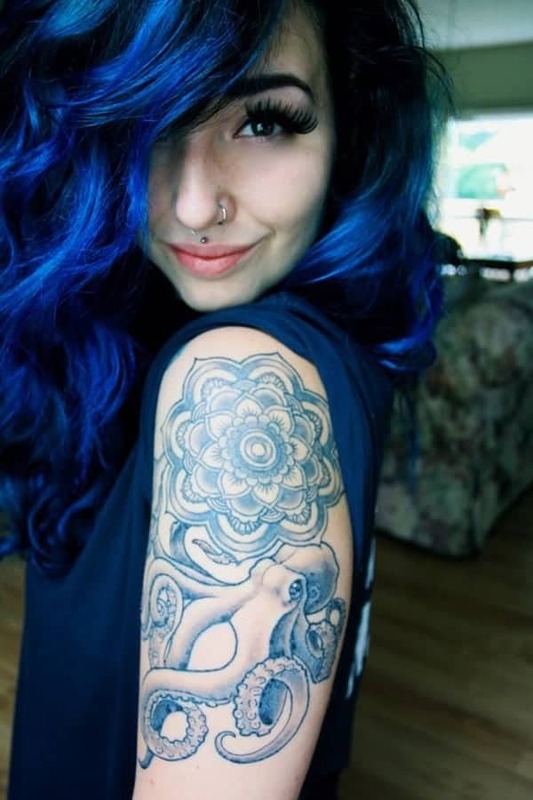 This girl clearly loves the color blue and we see that with her hair as well as the many tattoos that she has. 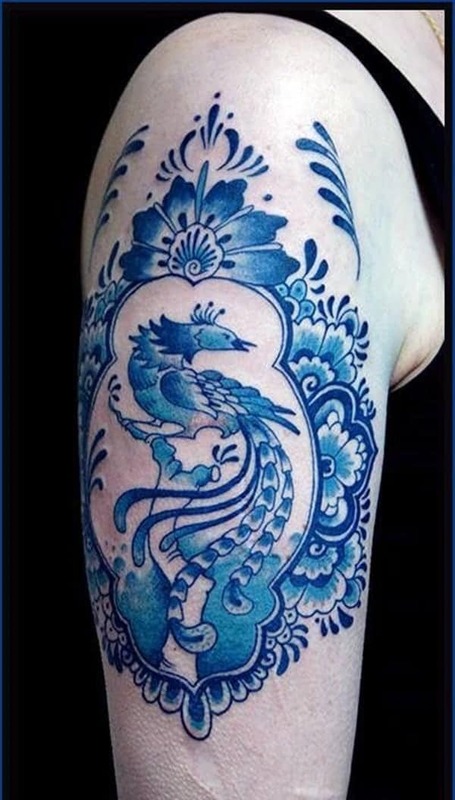 A stunning tattoo like this has a ton of different shades of blue throughout. It appears as if the sun is hitting it and creates the different shades of color. 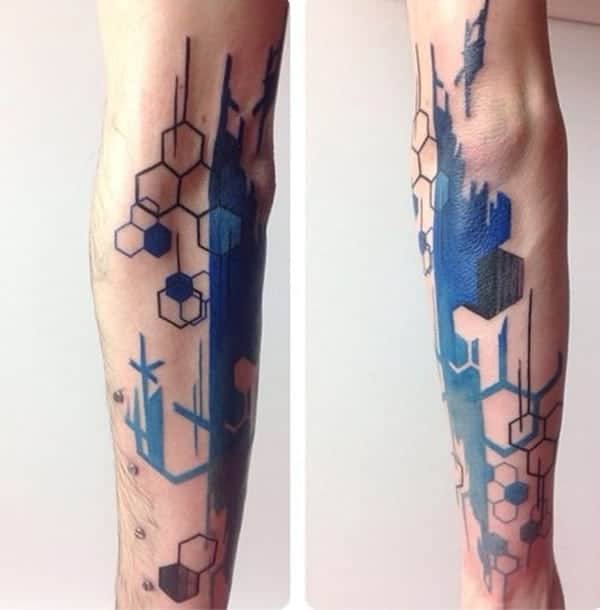 Blue is only a side color in these tattoos. 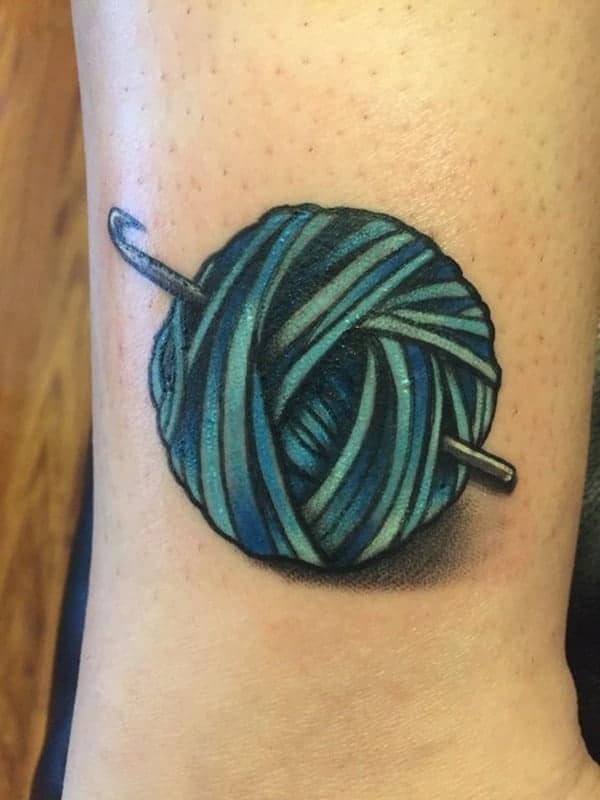 A cute tattoo design for those artists that work with yarn. 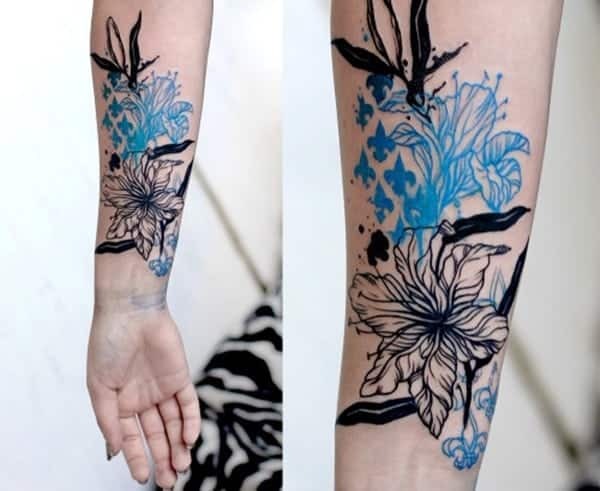 Floral tattoos are one of the most popular tattoo options available to you. 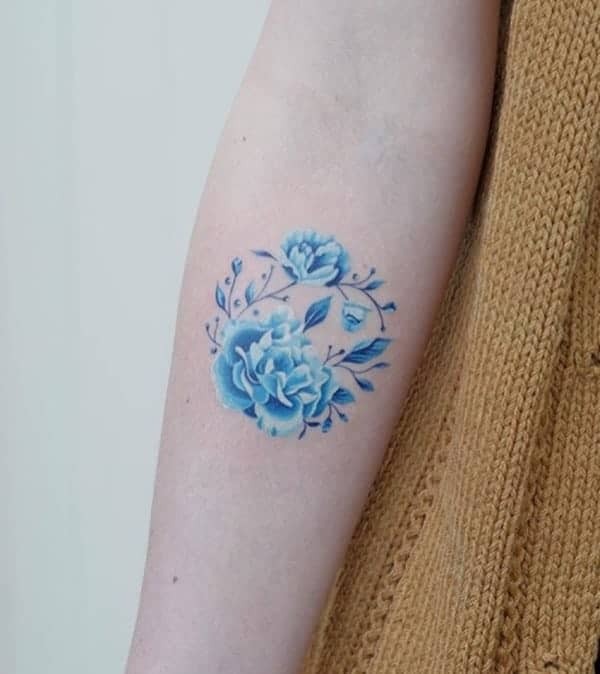 We love this soft shade of blue on the flowers. A stunning style like this is sure to draw the eye. The colors are striking and you are sure to be getting compliments all day long. 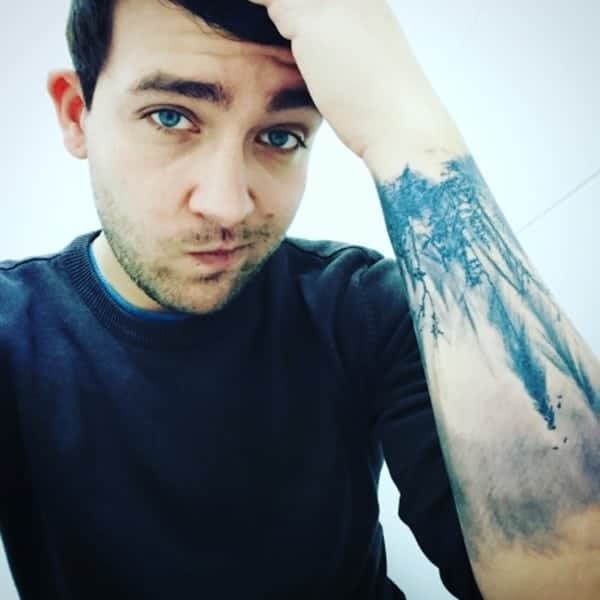 If you want a tattoo that looks really cool, then this is the style for you. What a gorgeous sleeve design. You won’t find too many that are as eye-catching as this one. 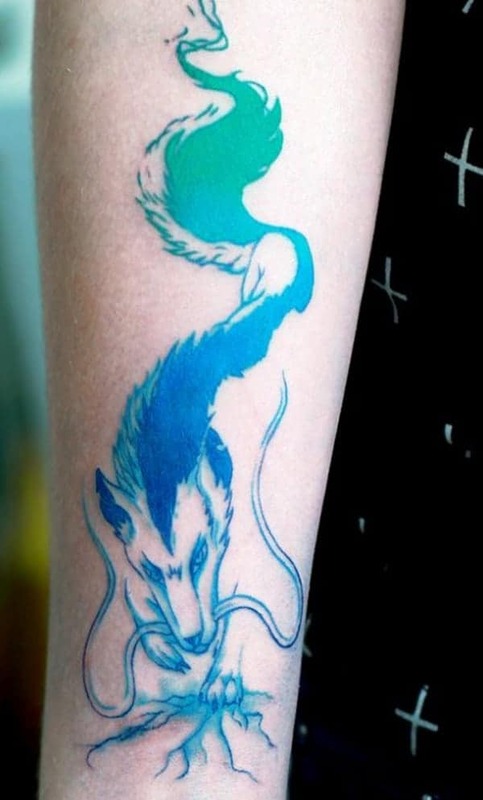 The blue just pops right off the arm and the images themselves are badass and elegant. 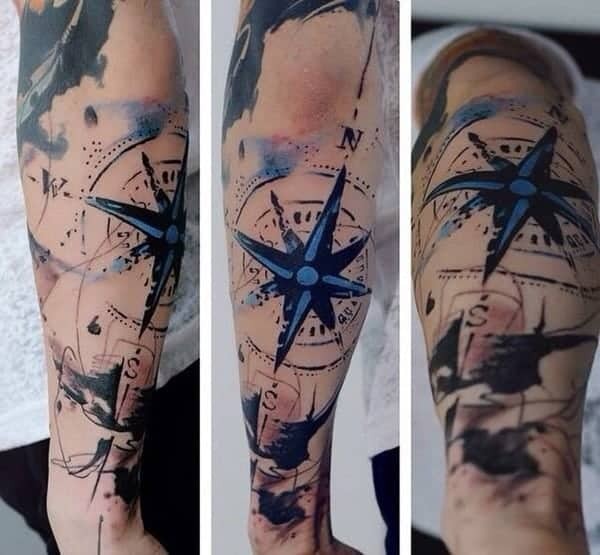 If you are looking for a sleeve design, this one is definitely a cool one to look at. This blue is bright and beautiful. It almost looks like vintage art. 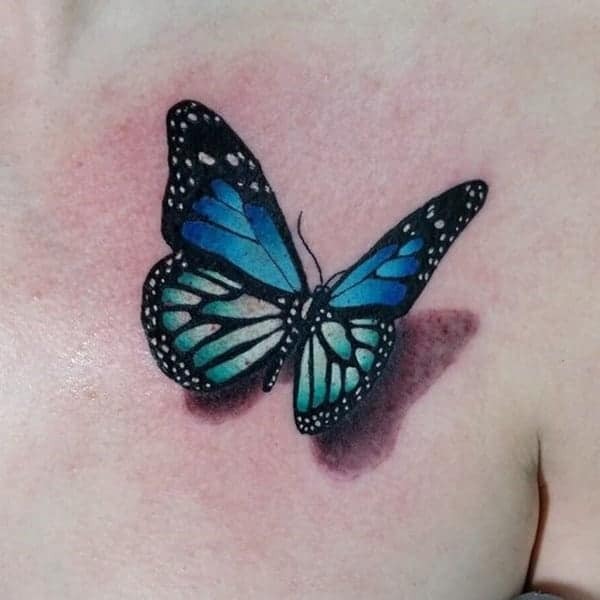 These butterfly tattoos are pretty cool because when they are in 3D, they look like they are popping right off your skin. The blue also makes for a striking color. 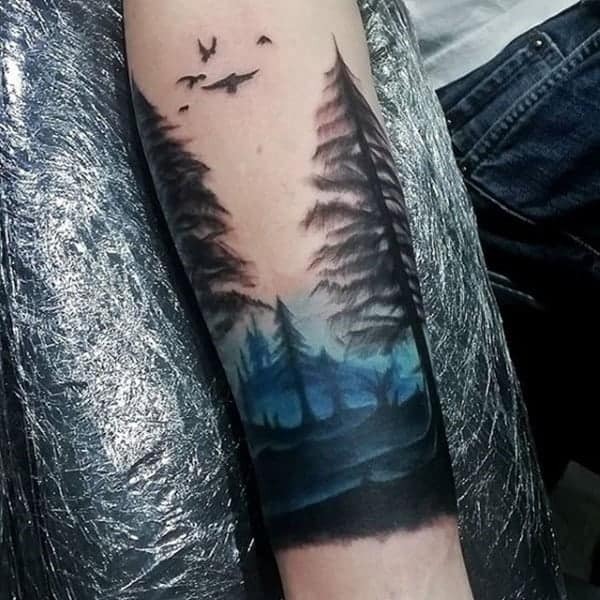 This is a really beautiful design of the wilderness and it makes a pretty cool sleeve tattoo. 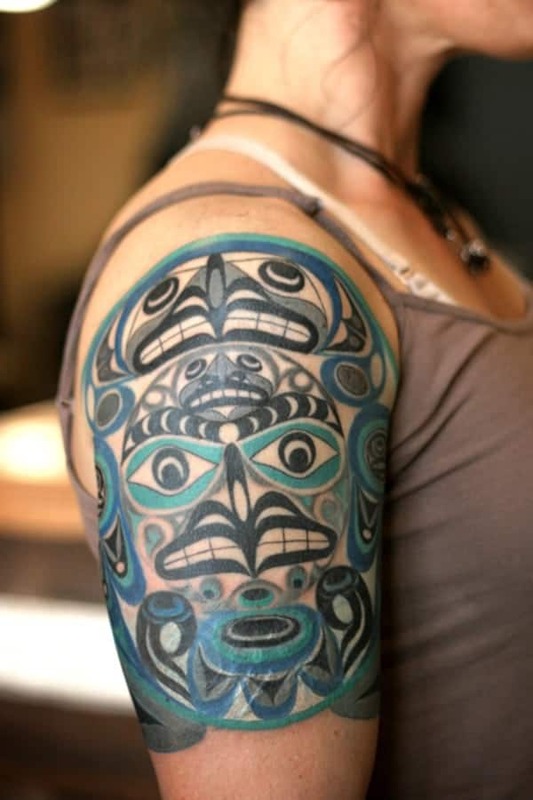 If you want a tattoo that is breathtaking, then you came to the right place. 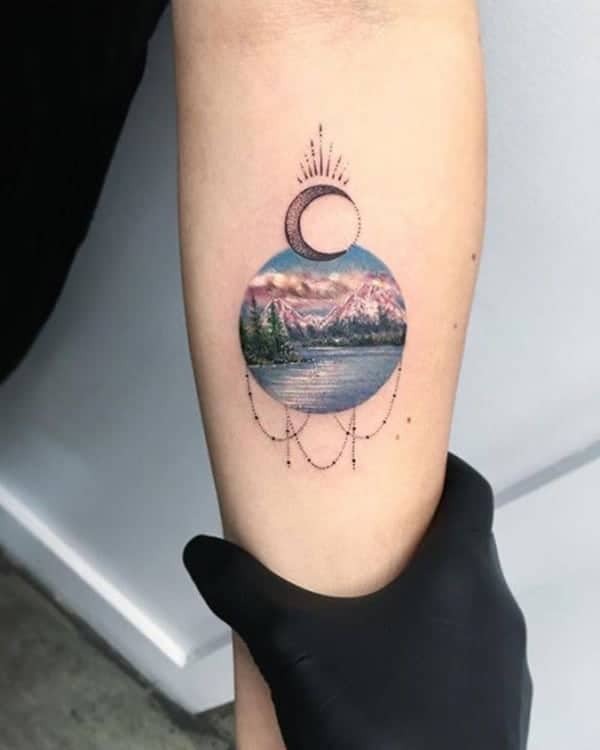 This doesn’t even look like a tattoo; it seems more like a painting on the arm. 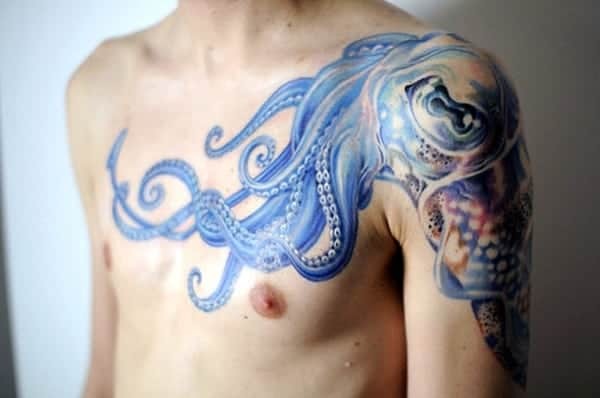 If you are looking for a large chest design, then look no further than this octopus tattoo. 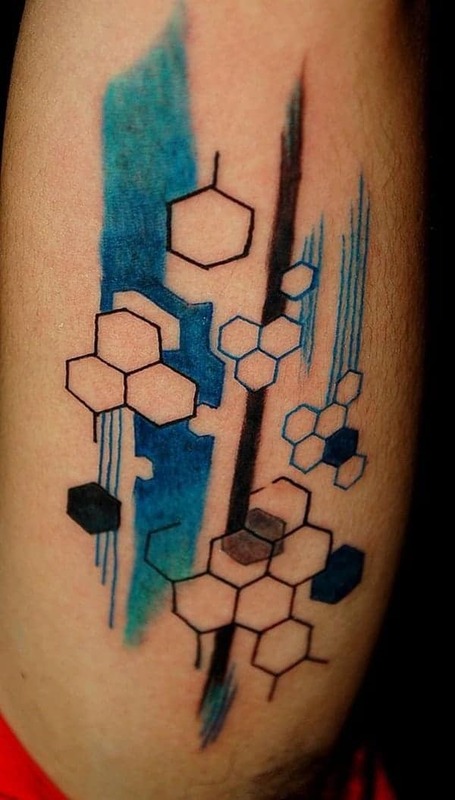 Another cool tattoo made up of geometric shapes. 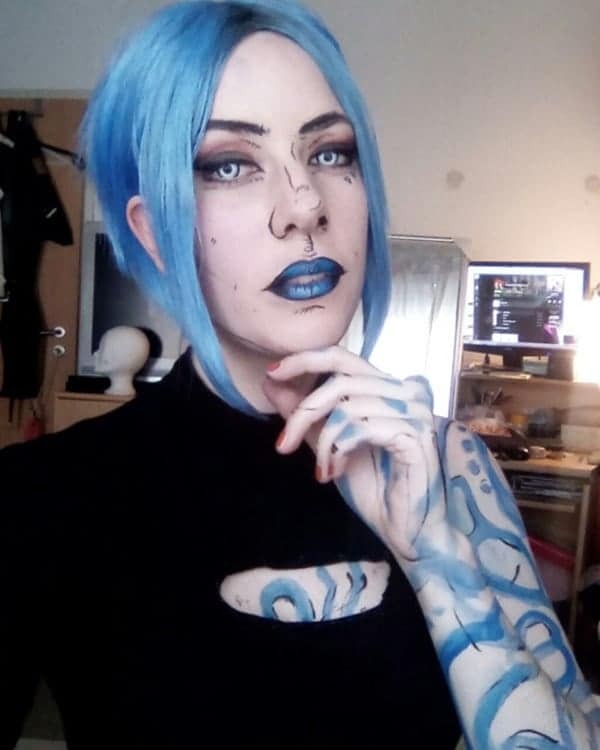 You can get basically any tattoo design you want in blue. 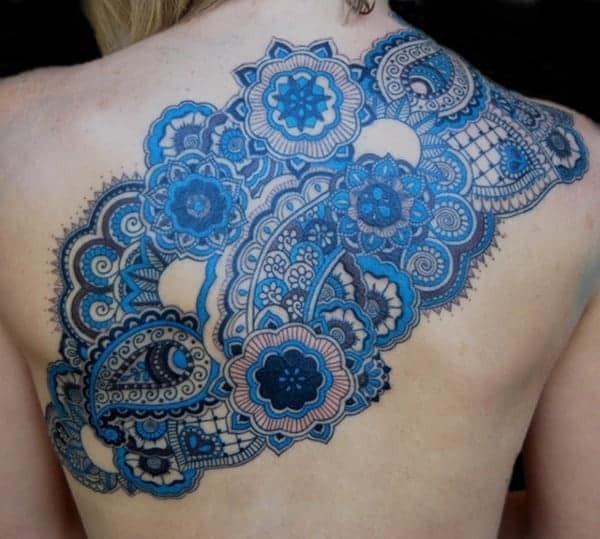 These sleeve designs are gorgeous because of all the intricate shapes and shading. 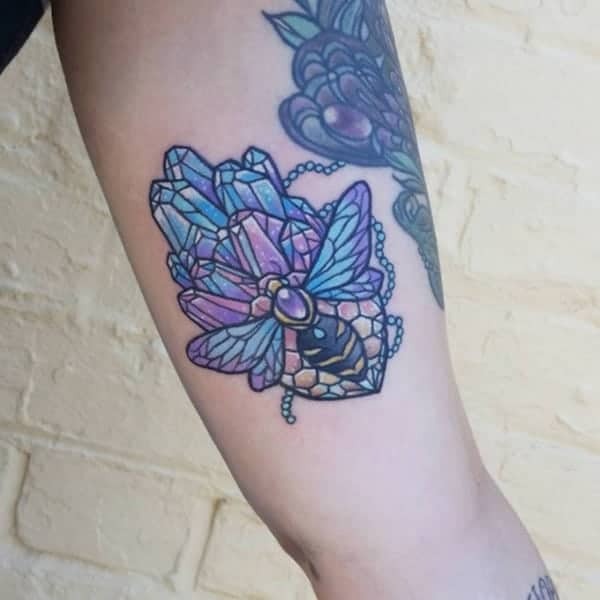 This cool style is also a geometric tattoo. These types of designs are always eye-catching. 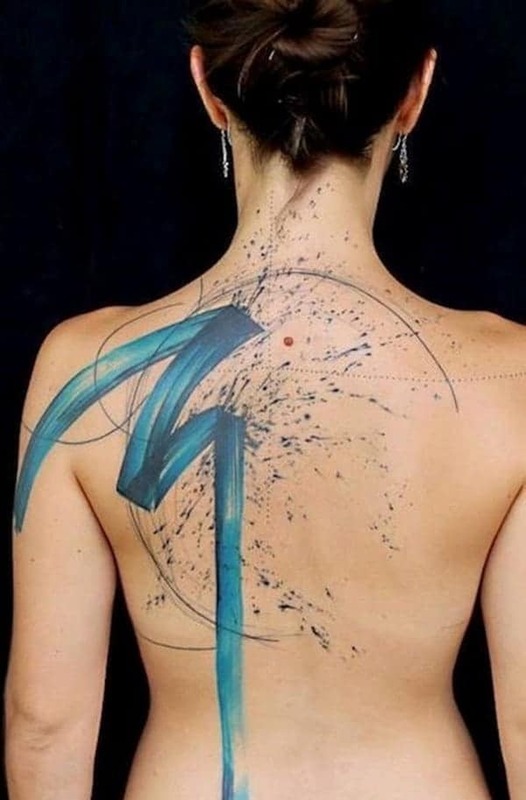 These kinds of tattoos are perfect for an artist that just so happens to be a painter. Have brush strokes down your back and be a work of art yourself. 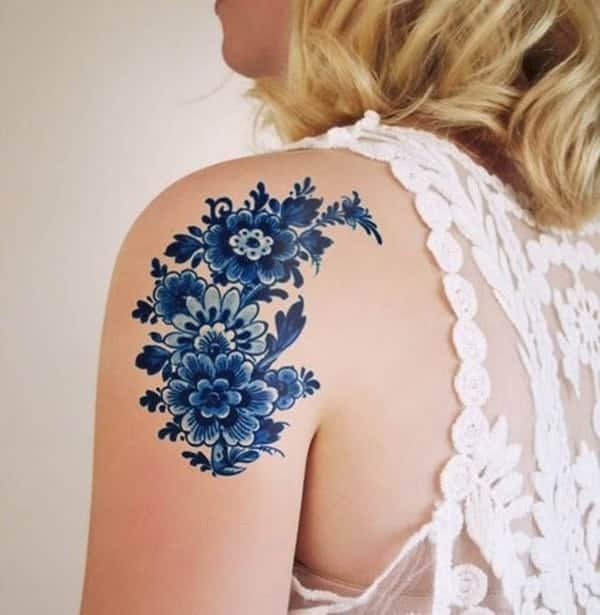 Another vintage take on floral tattoos. The octopus is another popular design for a tattoo. Is it an angel wing, or a bird wing? 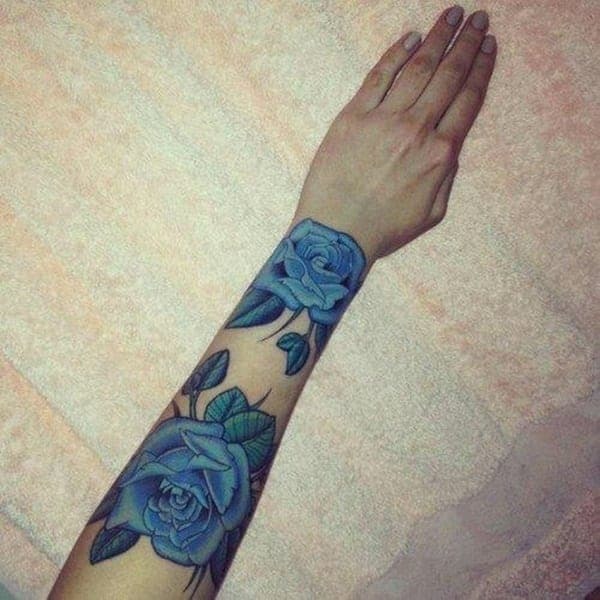 This gorgeous sleeve design is truly eye-catching because of the amazing blue and black shading. 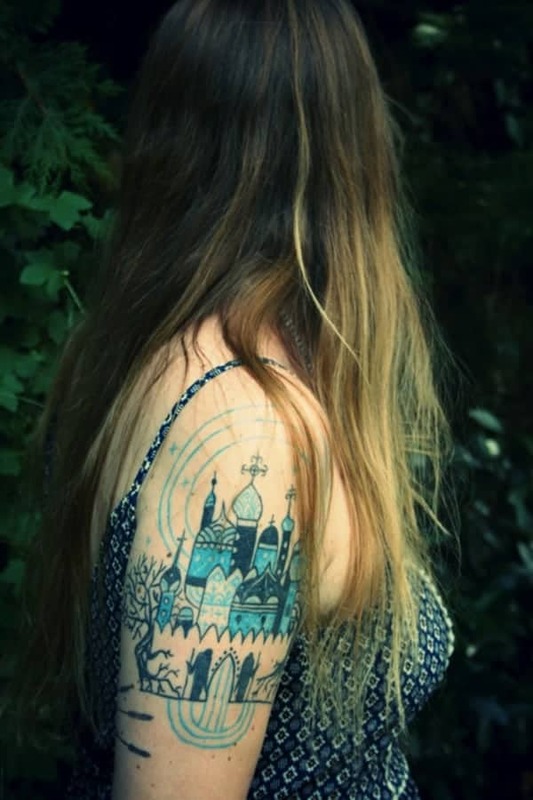 Why not celebrate your religious beliefs with a tattoo like this one. 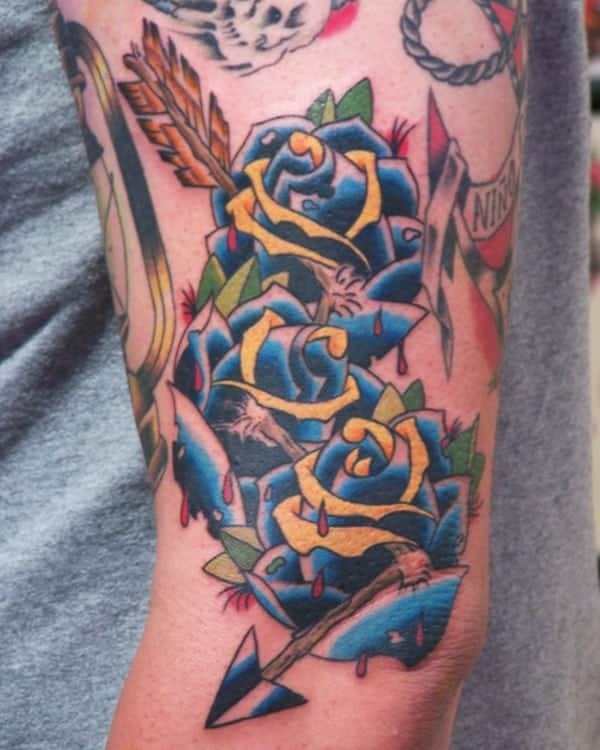 The bright rose really makes the whole tattoo stand out. 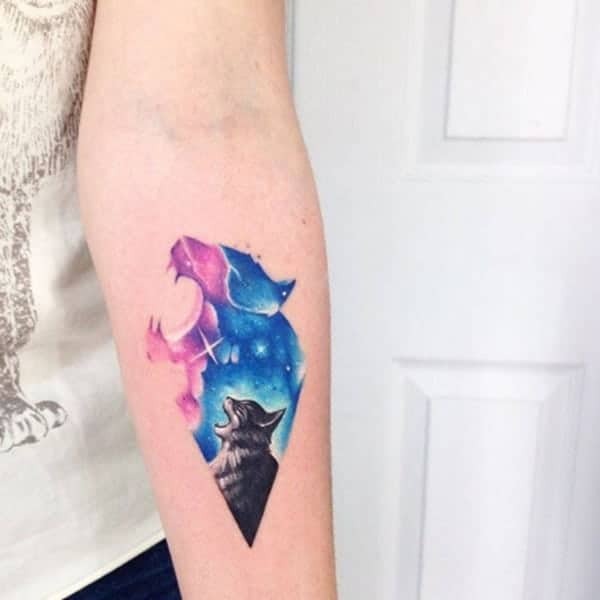 This is another gorgeous tattoo that is truly unique. We love how the green turns into the blue quite easily. 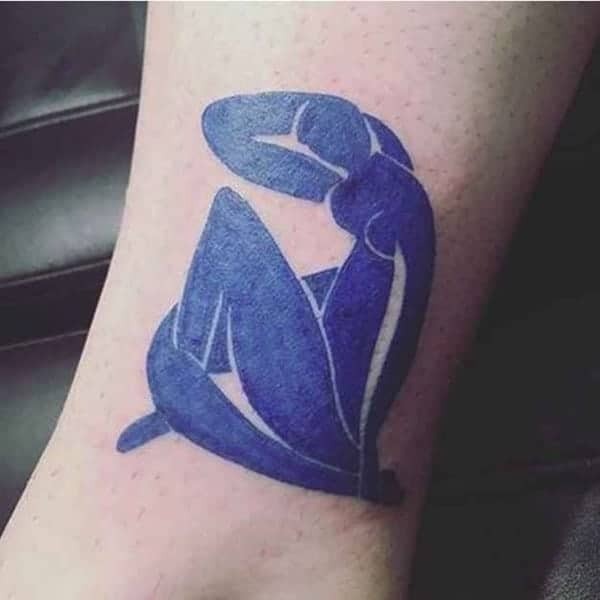 This tattoo looks like something you would find on a caveman’s wall. 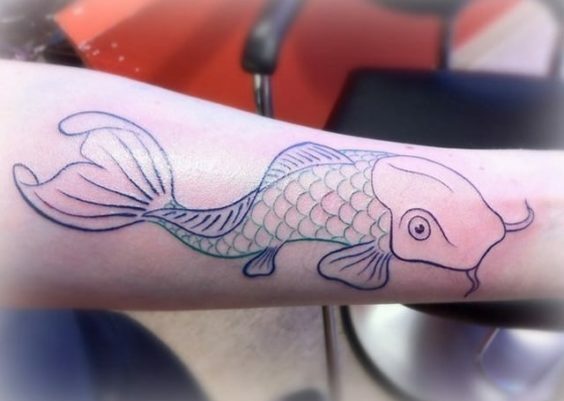 A truly one of a kind tattoo. 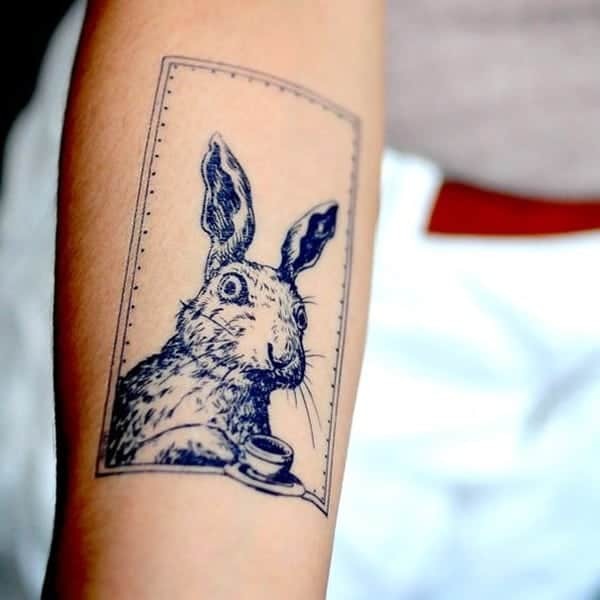 This is certainly an unusual tattoo design bit one that is a pretty cool concept. Another great vintage style that you are sure to love. 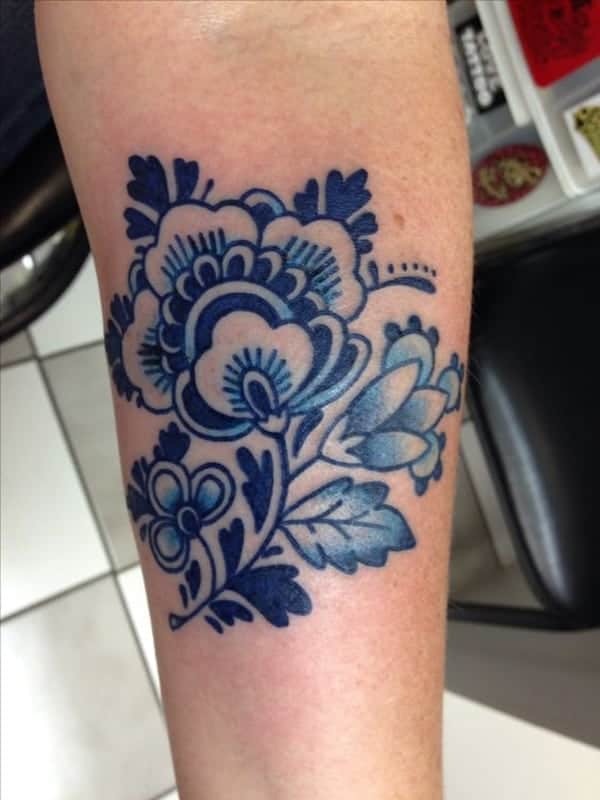 We love the deep blue of this gorgeous floral design. 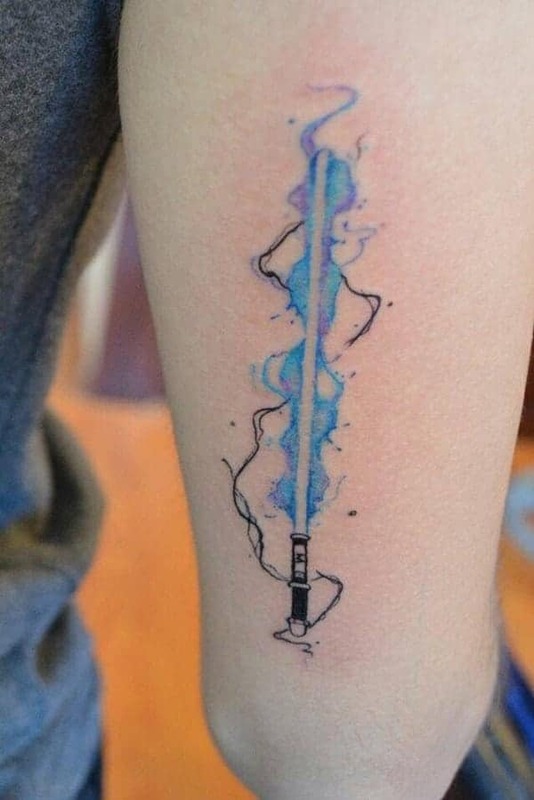 If you have always wanted a lightsaber, then why not try one out as a tattoo design? 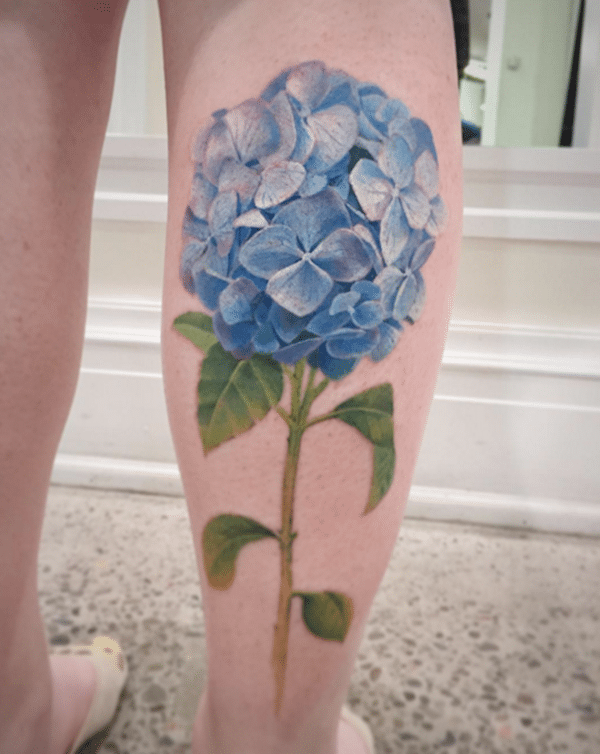 This is a large tattoo and one that really stands out because of the amazing blue color. 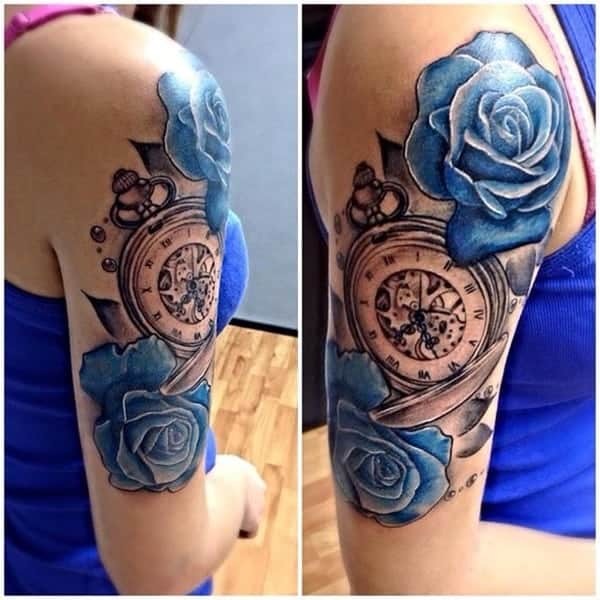 Another cool sleeve design that mixes flowers and watches together. The color is perfect for this type of design. 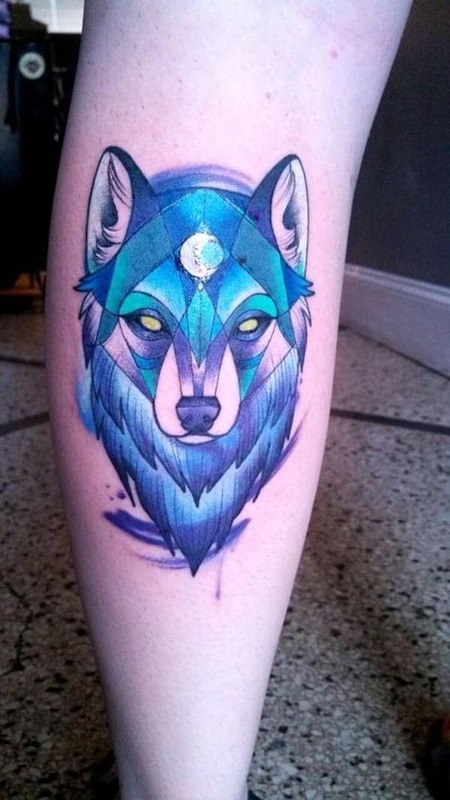 This wolf tattoo is another geometric style and the blue really gives it a mysterious look. 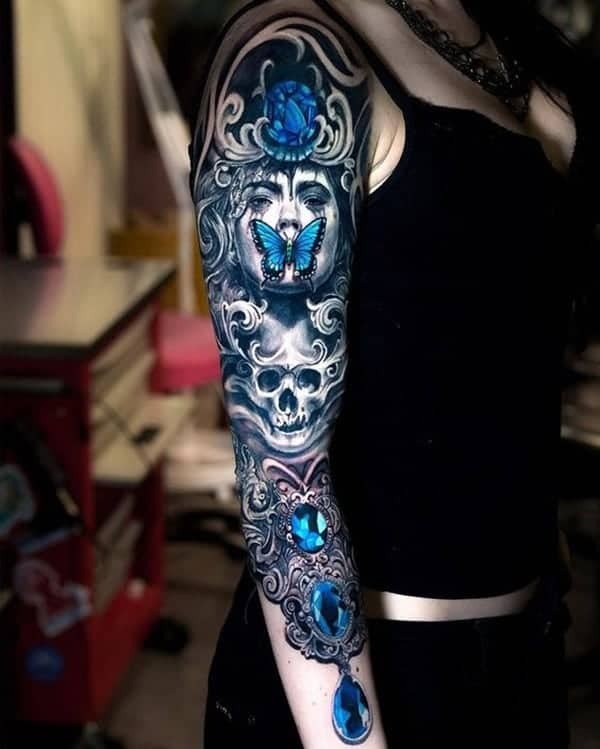 This gorgeous sleeve design has some great blue coloring to it. There are even some neon elements in the flower that really help it to stand out. You can almost feel life in the flowers because of the shading. 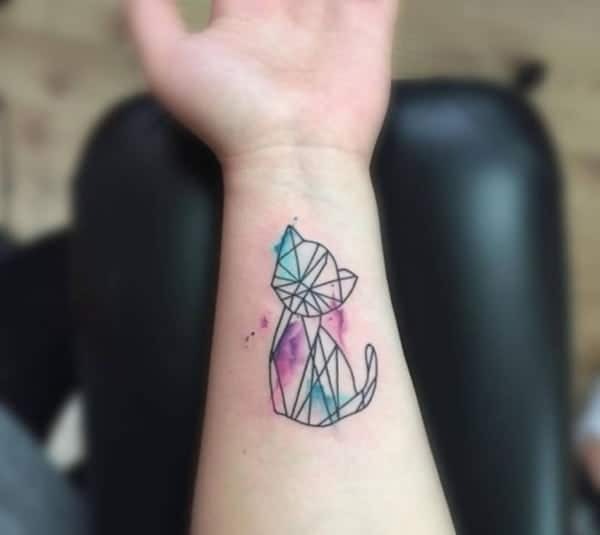 A small tattoo design that you are sure to love. 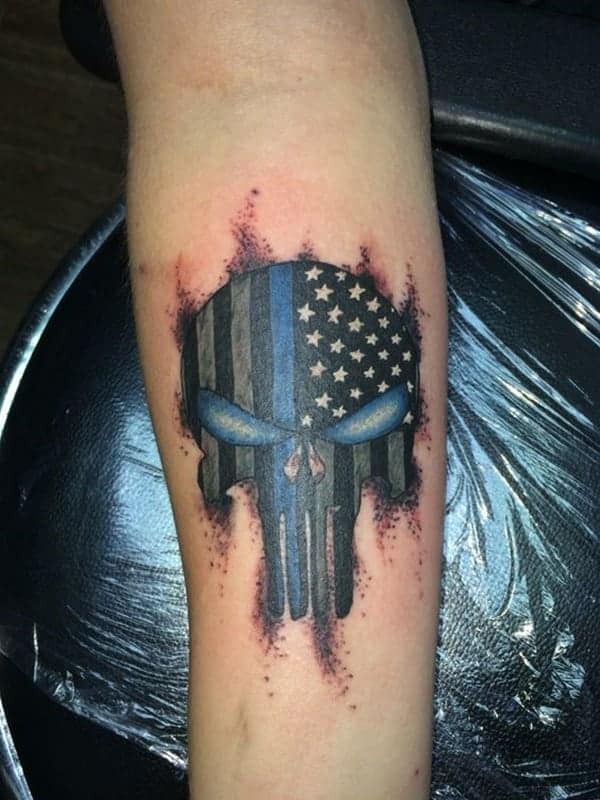 If you are looking for a badass tattoo design, then you can’t go wrong with this cool Punisher tattoo. 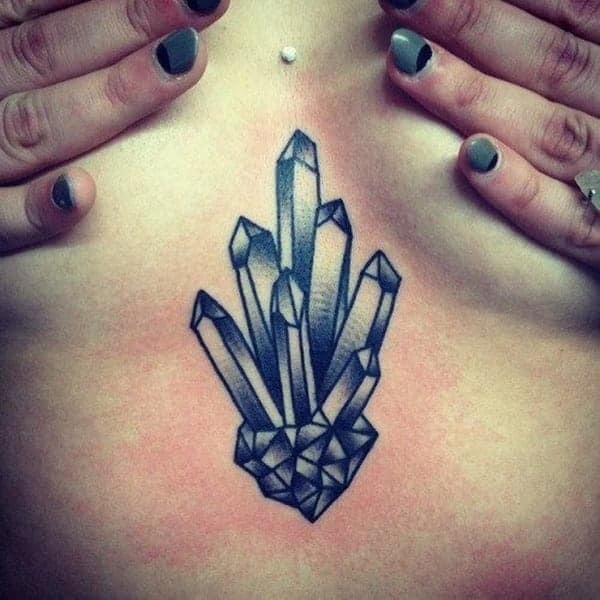 This is a gorgeous tattoo design and one that is sure to get you a lot of compliments. 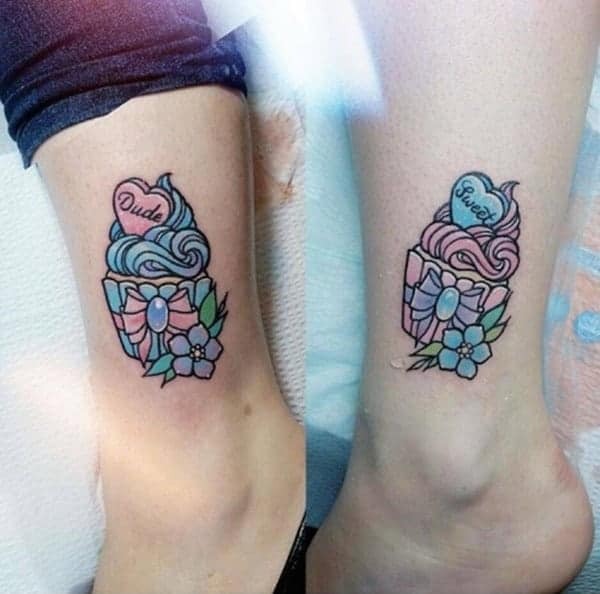 It’s a unique way of showing your love for the peacock. 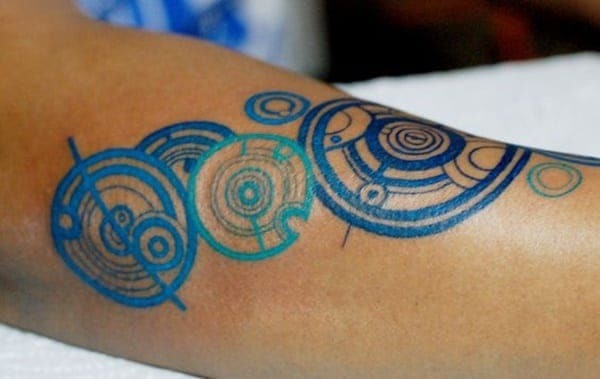 These tattoo designs are always talked about because they just look so cool. They could be gears, or they may even represent something alien. 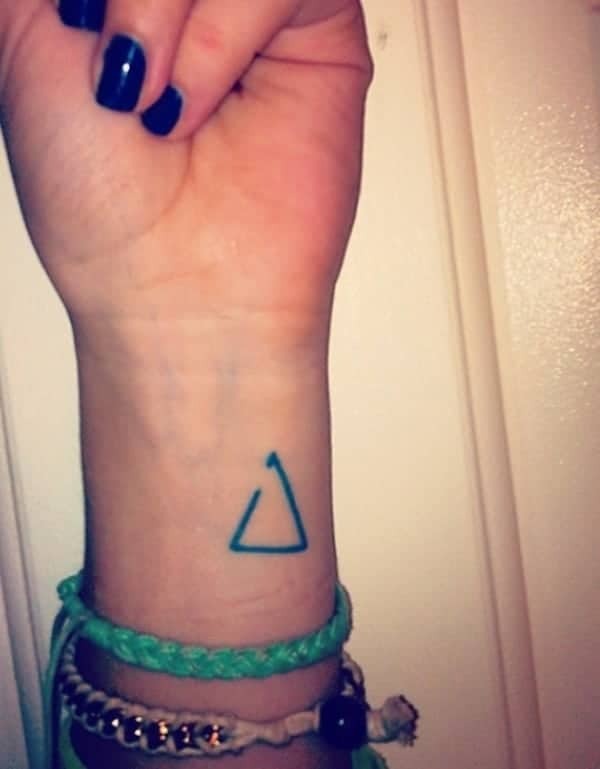 You don’t get much simpler than this tattoo and yet it holds a lot of meaning for the person wearing it. 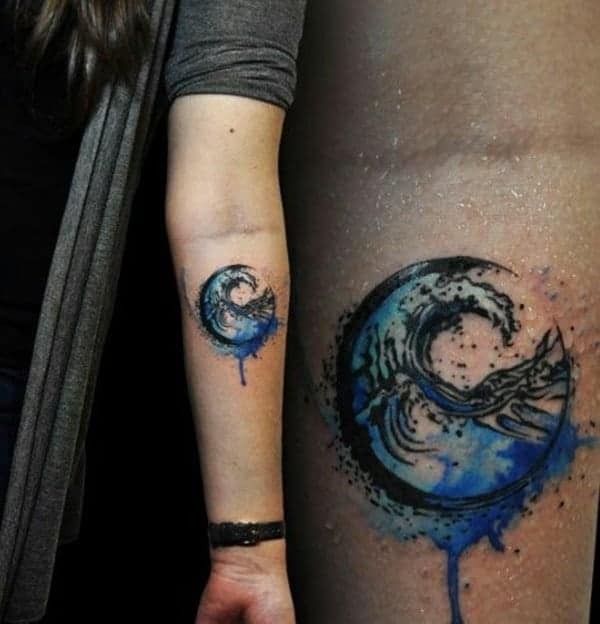 If you are looking to have a little fun with your tattoo, then this is a pretty cool image. Who wouldn’t want to have tea with this rabbit? 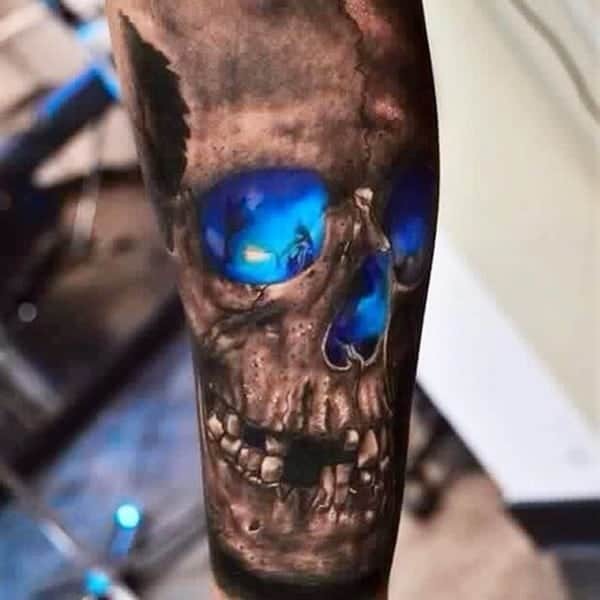 This skull has crazy detail to it; it’s as if it’s real. The colors are truly amazing and we can’t help but stare at the blue because it stands out so well. If you want something artistic but a little less realistic, then you must try this style out. 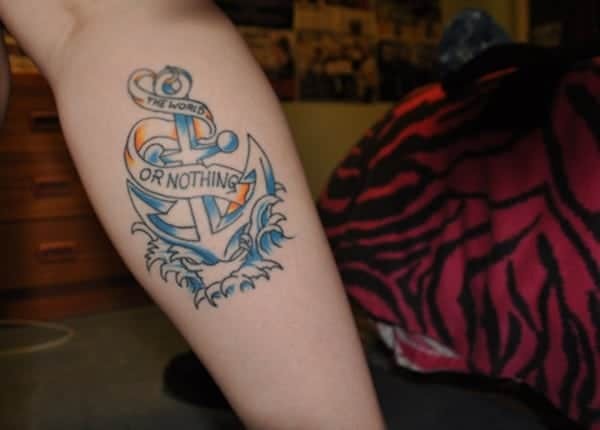 How could you possibly have a nautical tattoo without some blue in it? 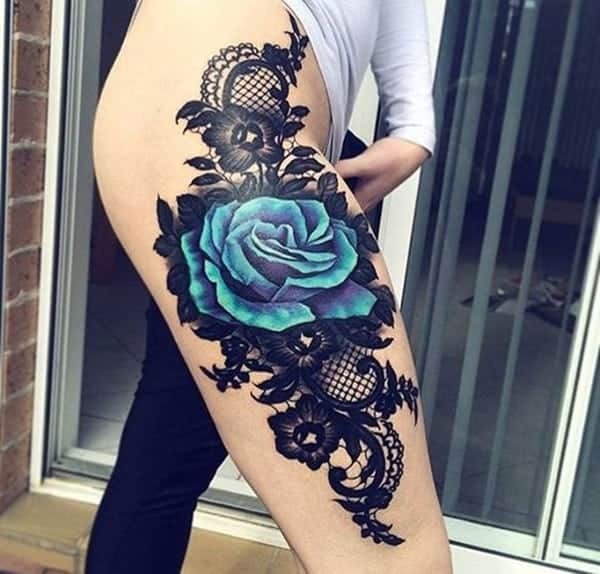 This is an edgy tattoo that is sure to draw the eye. 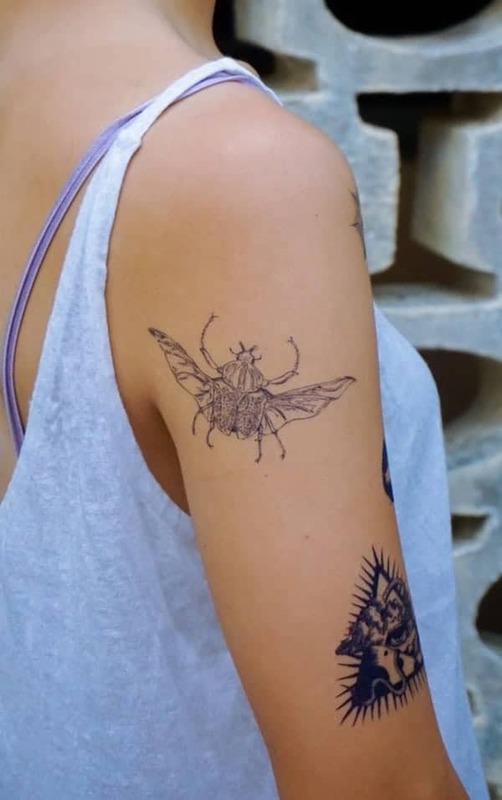 This is a beautiful tattoo of flying birds on her arm. 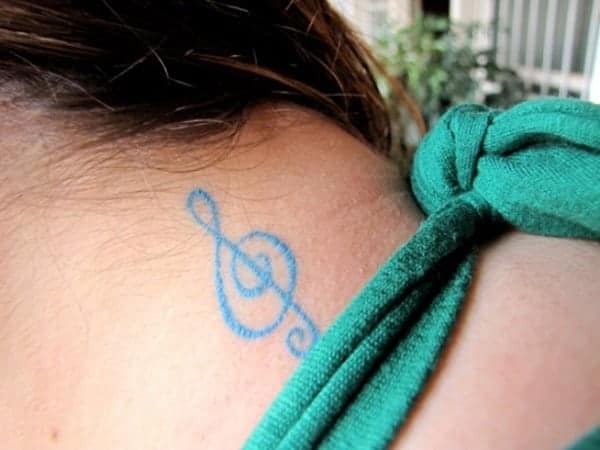 If a small tattoo is what you are looking for and you have a passion for music, then you can’t go wrong with this cool design. 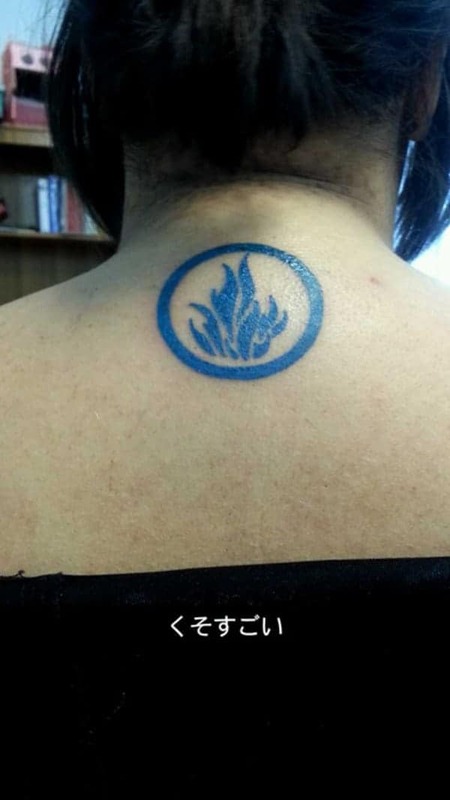 This back tattoo is pretty amazing. 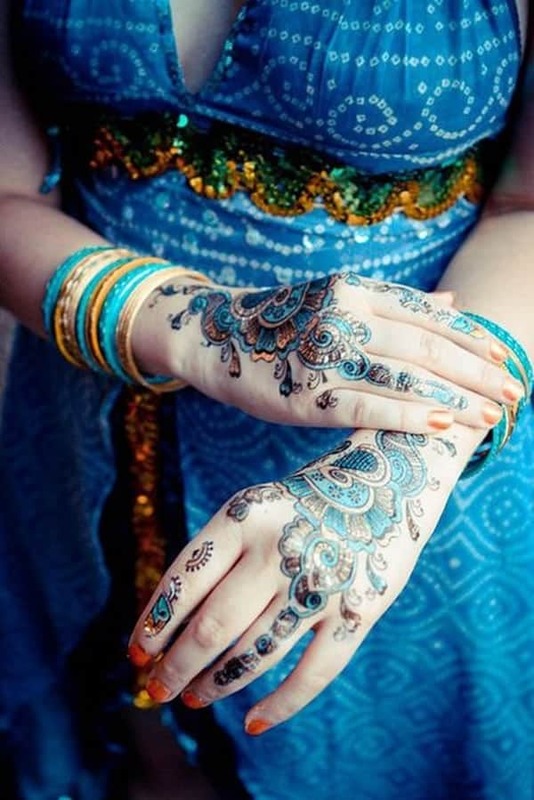 The color is beautiful and the designs are something you could look at all day long without getting bored. 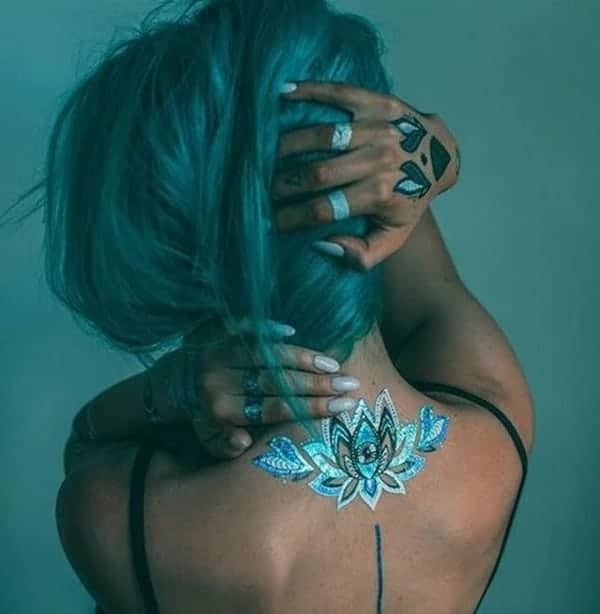 A cool shoulder tattoo that has some amazing colors to it. We love how the tentacles go right across the chest. 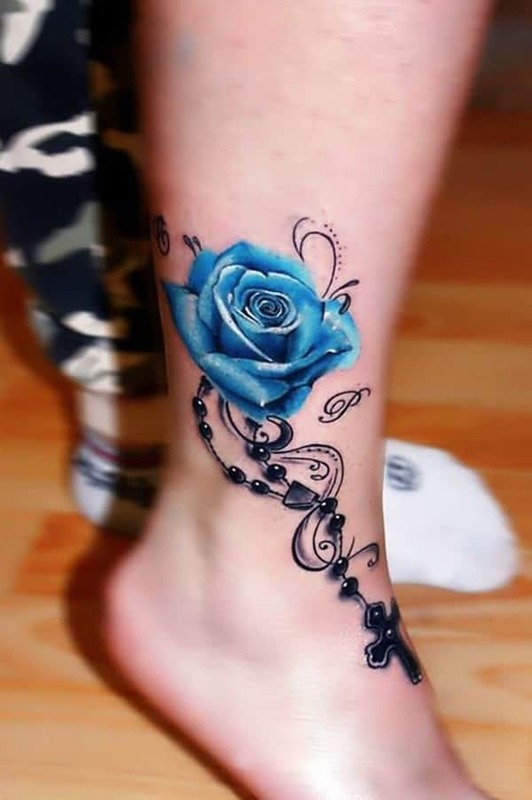 Another great tattoo design that is sure to catch the eye. A great tattoo design that has cartoon elements and even some blood. 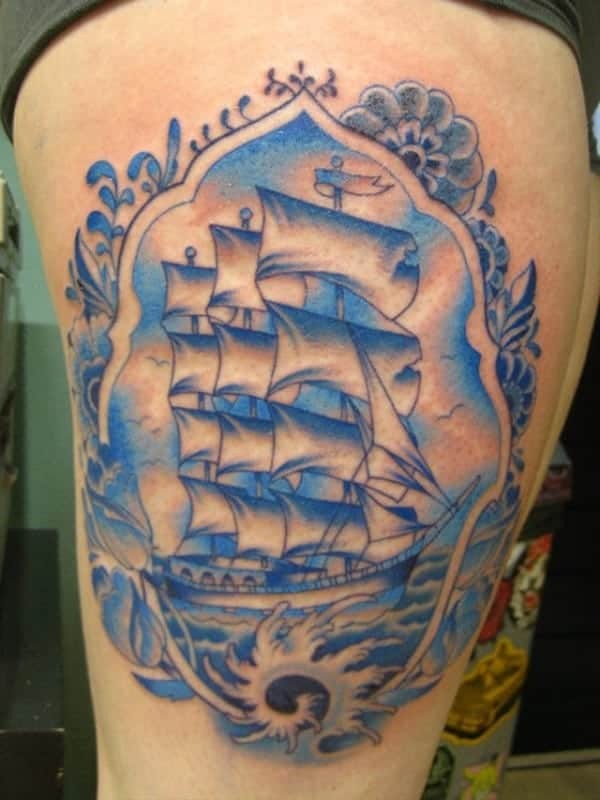 If you have a passion for old-world ships, then this would be a stunning tattoo to get. 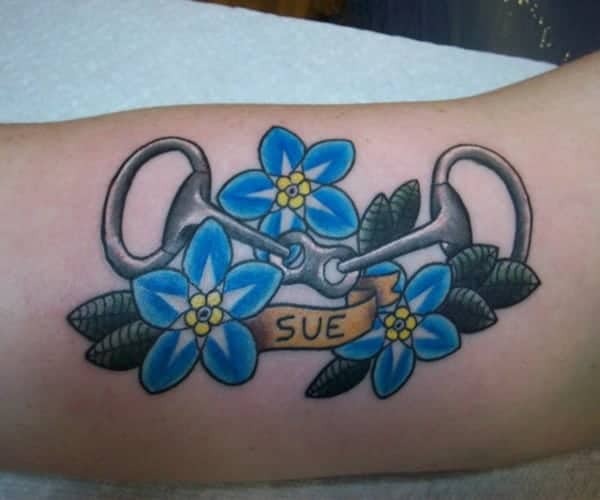 This is a sweet way of showing your love for a family member, friend or spouse. The feathers on this dreamcatcher are both realistic and have a stunning blue coloring. The bigger feathers are mesmerizing and they actually look like they are moving. Maybe you love the movie Frozen or just love winter adventures. 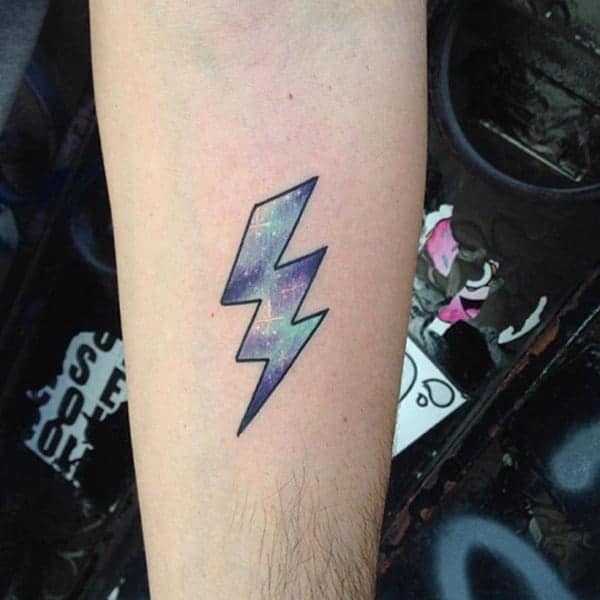 Either way, this is a cool tattoo. 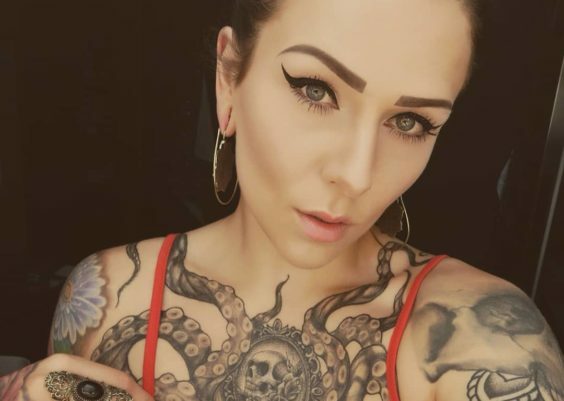 This under the breast tattoo is certainly eye-catching. 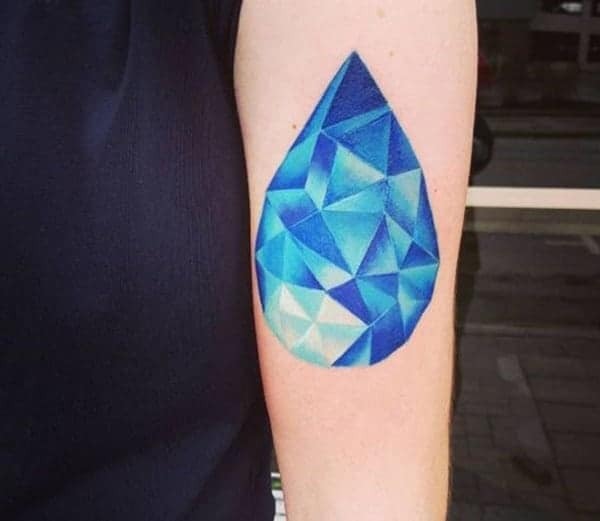 Tiny blue diamonds are all you need to have a cool finger tattoo. 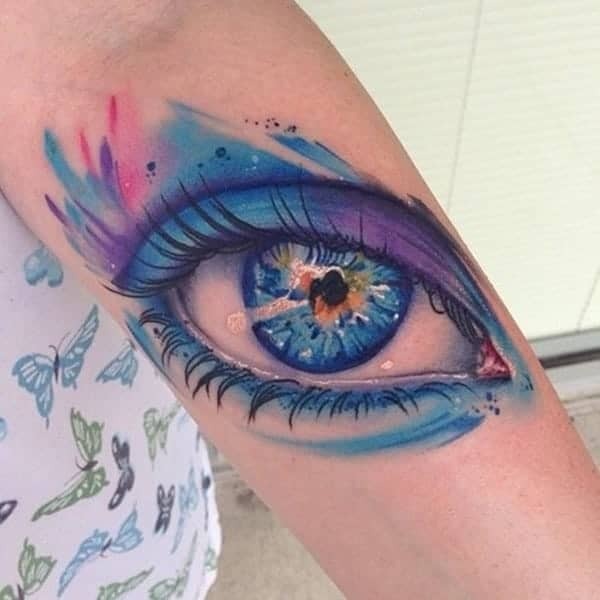 This may be the most realistic eye that we have ever seen. 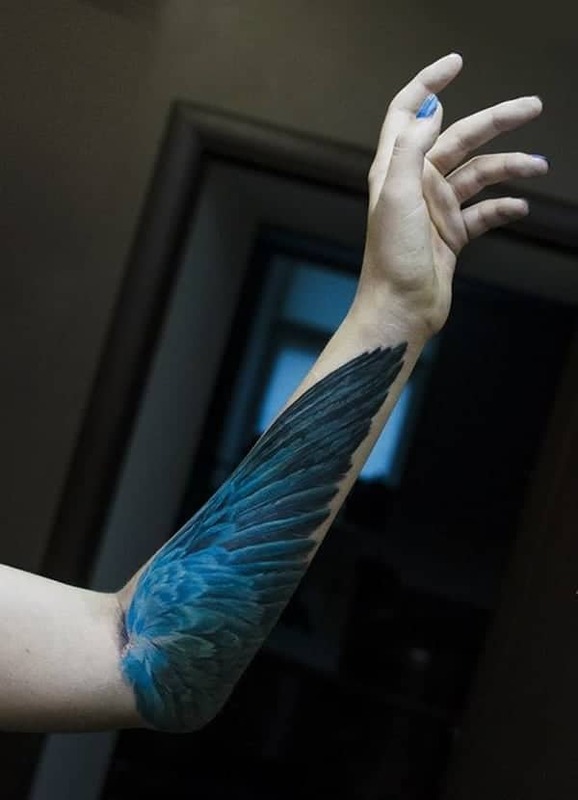 If you are an artist, you can appreciate a tattoo like this one. There are bold and beautiful colors here that are so breathtaking that you will want to stare at them all day. 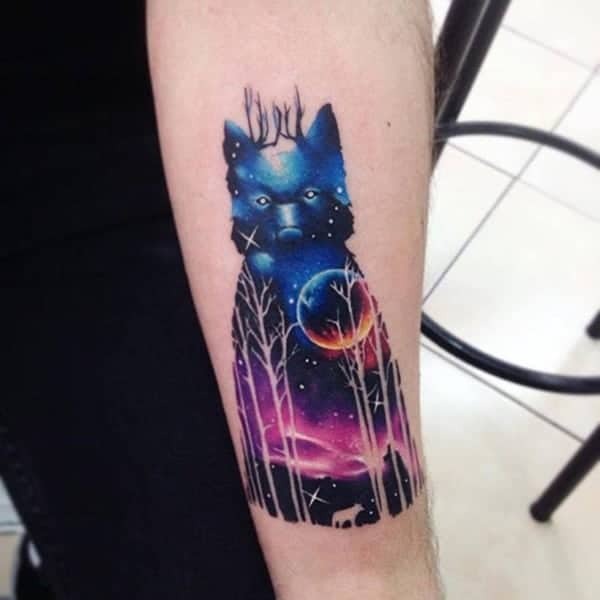 You won’t find a better tattoo design than this one. Have you ever wanted to sail around the world? 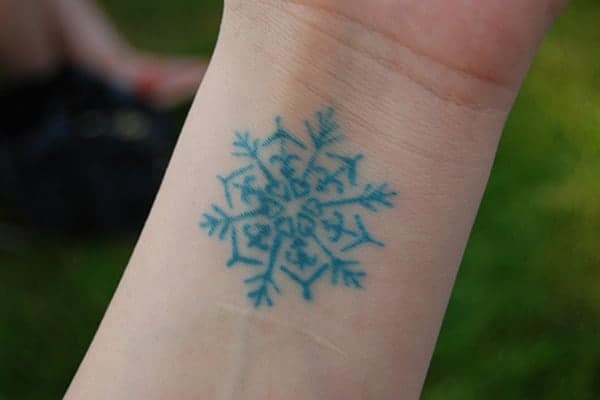 If so, then this might be the tattoo for you. 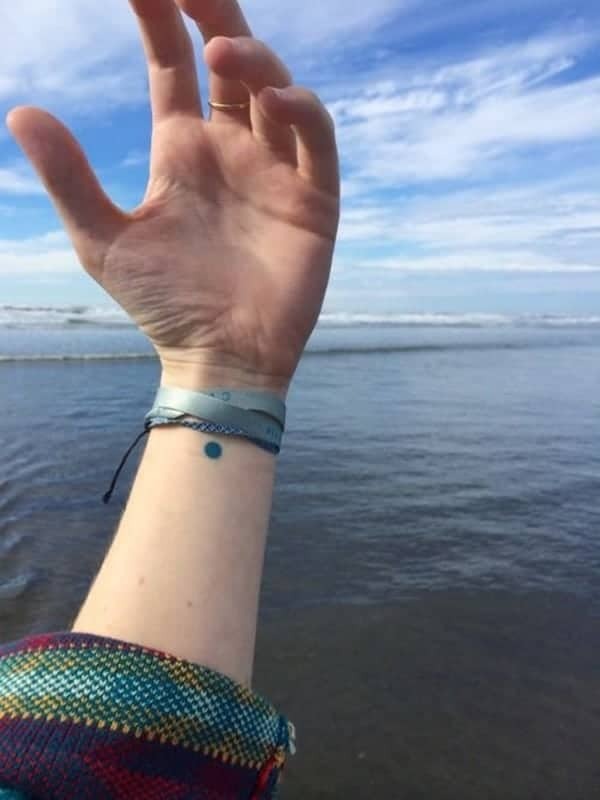 A small and interesting tattoo that represents your love of one of the natural elements. 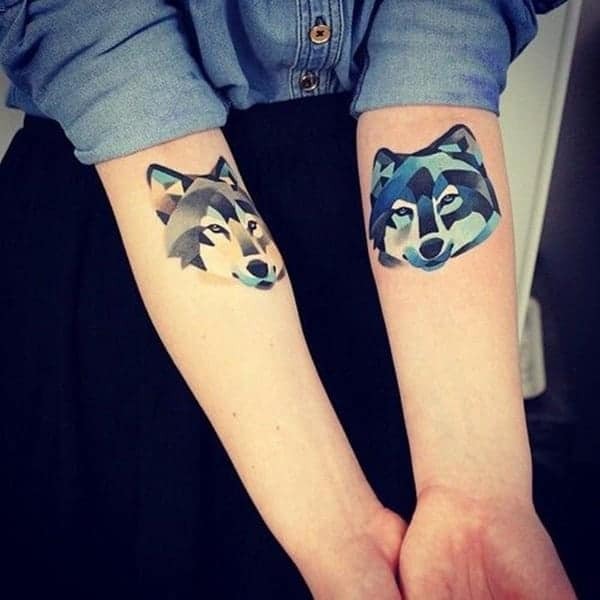 She must have a love for wolves because she has them on both of her arms, the only difference is that she has changed the colors. A style like this has a lot more meaning to it then you may realize. 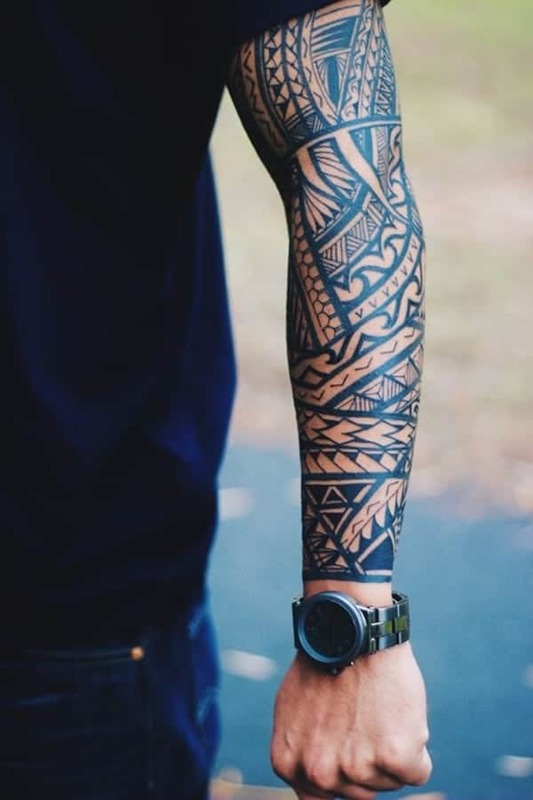 If you are looking for a cool sleeve design that represents your culture, then you are sure to love this style. Another great floral design that has some amazing flowers. 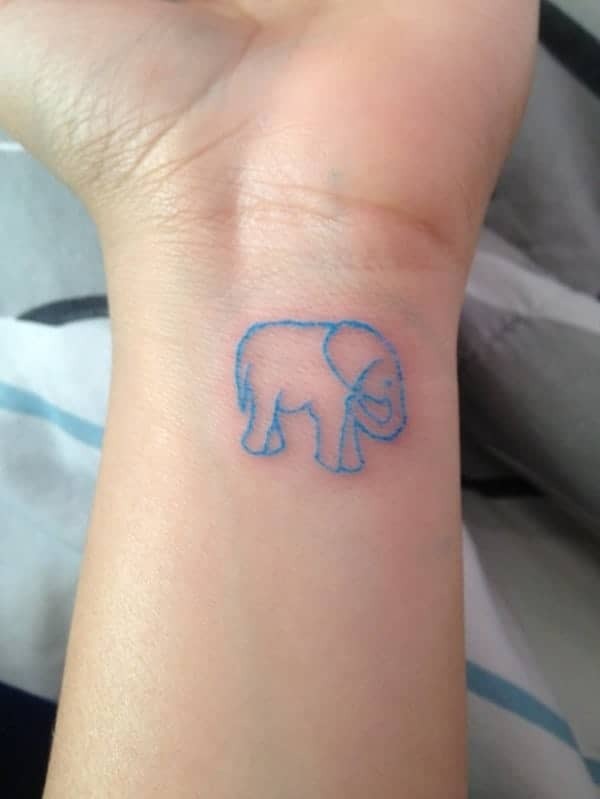 A great idea for those that love the wisdom and soul of an elephant. 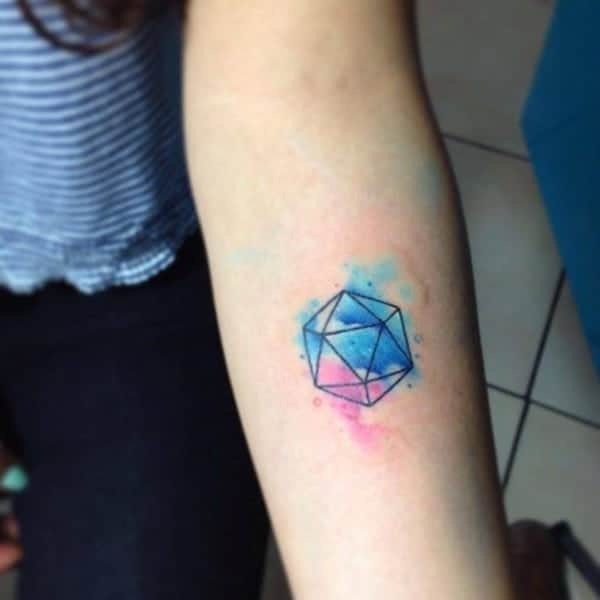 This is another amazing geometric tattoo that has splashes of stunning colors. 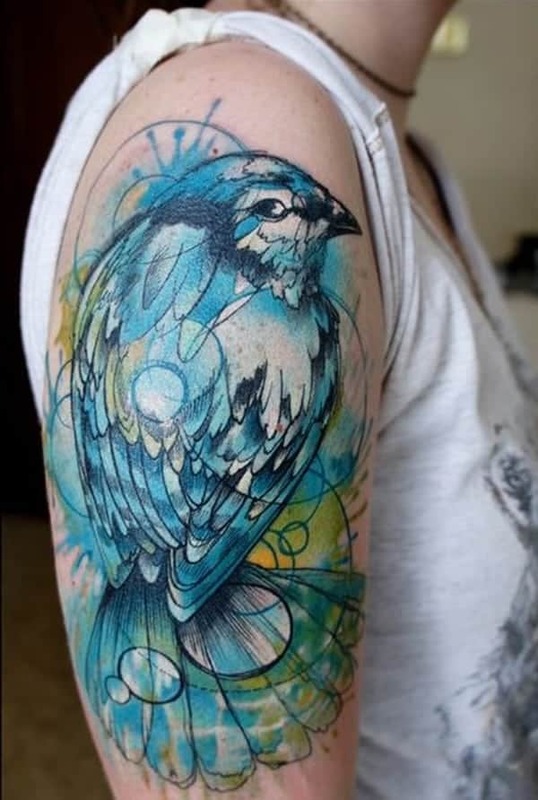 We love how the bird is immersed in the shapes and colors. 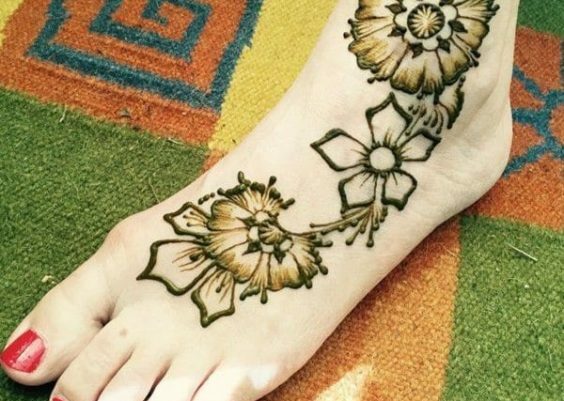 If you are a fan of the Henna style, then why not get permanent tattoos of something that is eye-catching and authentic. 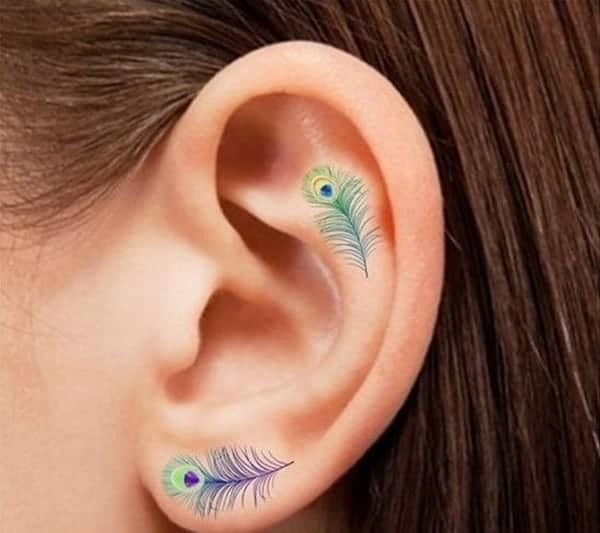 A tattoo like this one is sure to get you compliments wherever you go. We love the contrast between the dark black and the light blue. 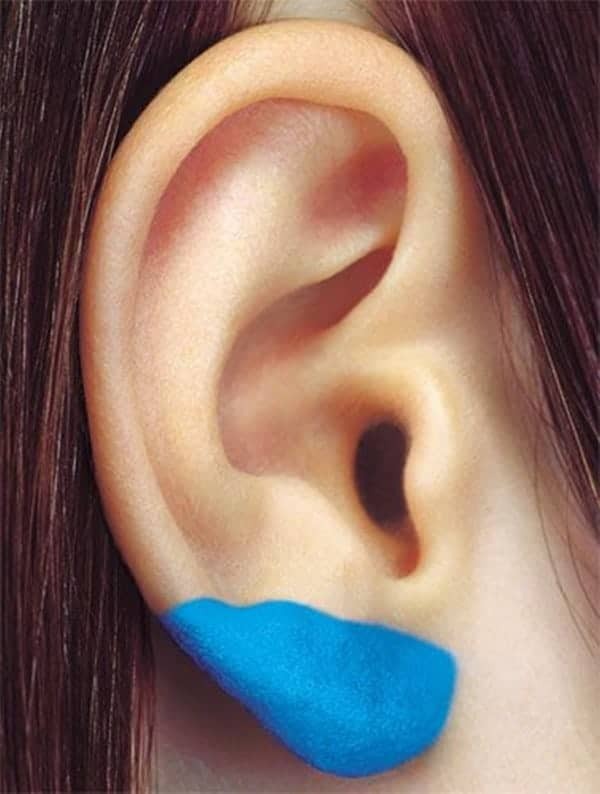 A neon style blue and white ink are a great way to create a tattoo that practically pops off the skin. 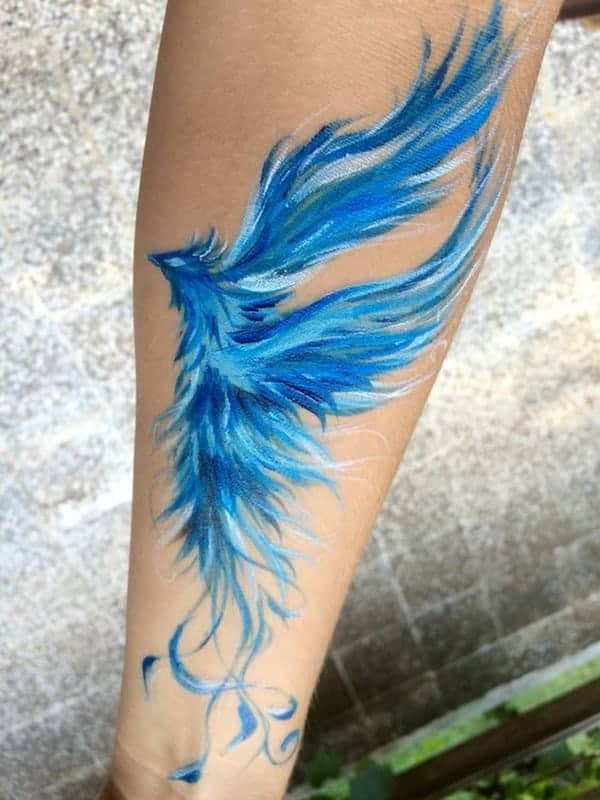 We love how it looks like the color is dripping down the arm. 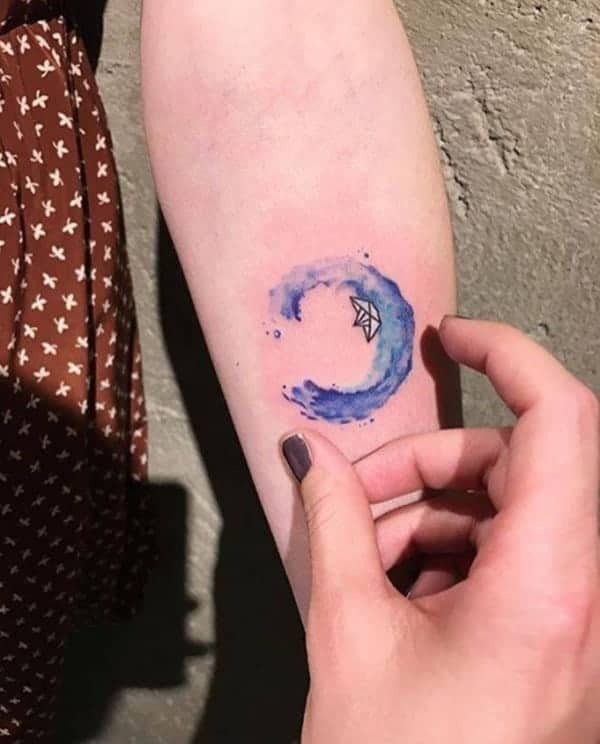 If you love the waves or the ocean in general, then you are sure to rock out this tattoo this year. 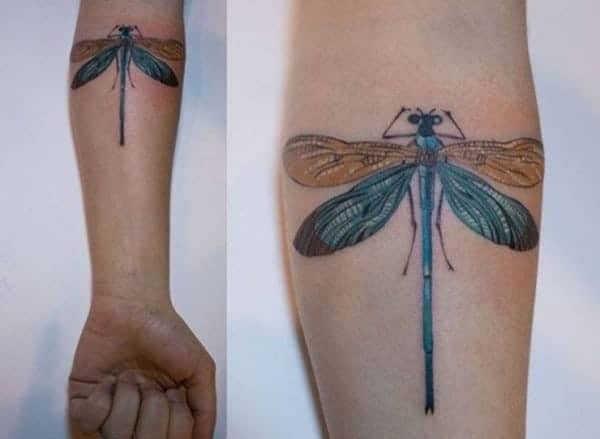 Dragonflies are one of the most beautiful and eye-catching creatures on the planet. A cool image like this is all about the colors. 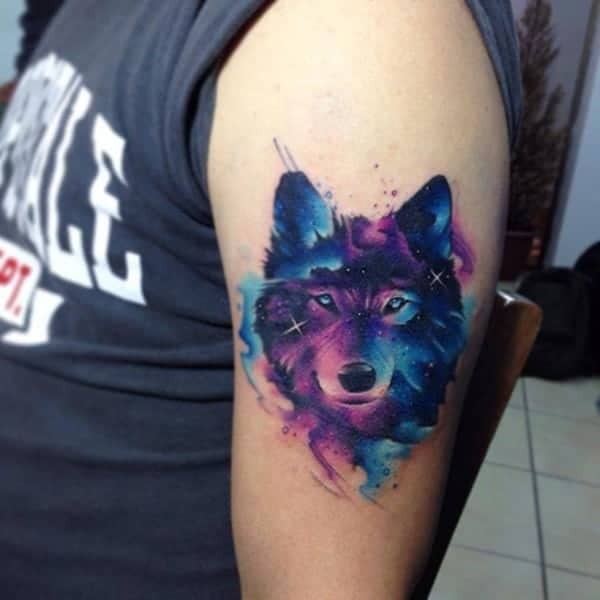 A stunning tattoo design that has some breathtaking colors to it. This dark blue really pops off the arm. If you are looking for a mysterious and badass design, then you just found it. This little kitten has bigger dreams. 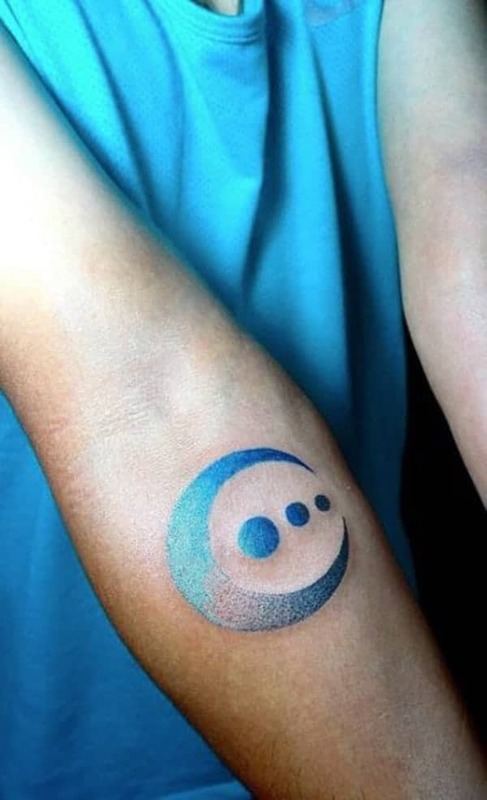 If you are a dreamer that wants to be so much more, then this tattoo is sure to inspire you. 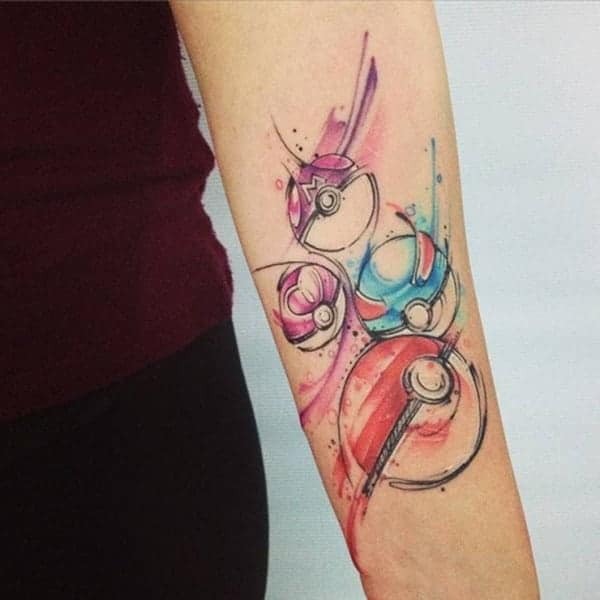 If you are a fan of Pokemon, then you are sure to love this cool sleeve design. 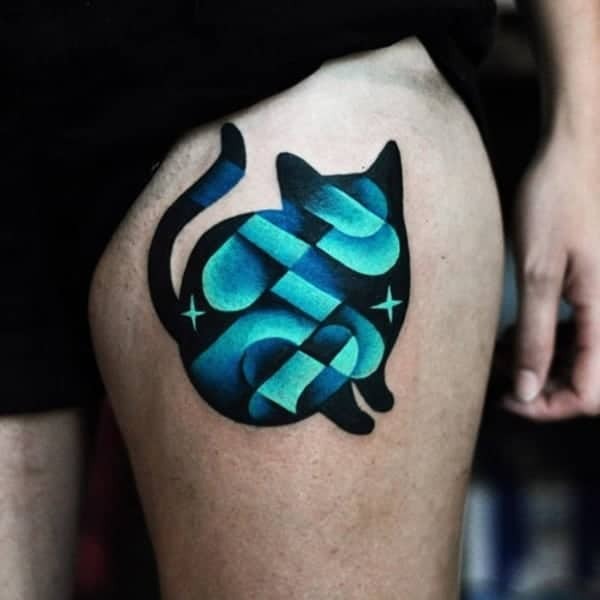 If you are a cat lover, then you are sure to love a style like this one. As an artist, you can represent your passions in creative ways. A cool design that is mystical and inspiring. 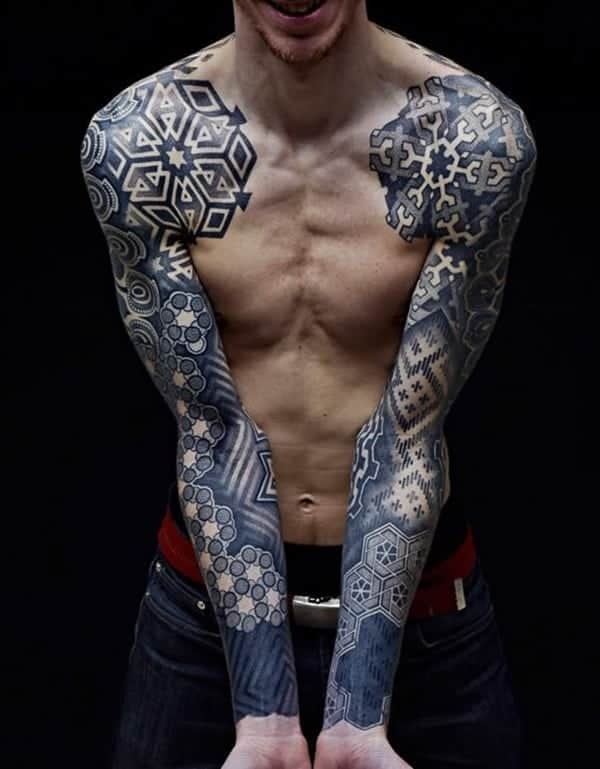 The sleeve tattoo is certainly unusual but it’s the kind of tattoo artists love. There is a bug and some jewels, but the best part of the style is the colors. 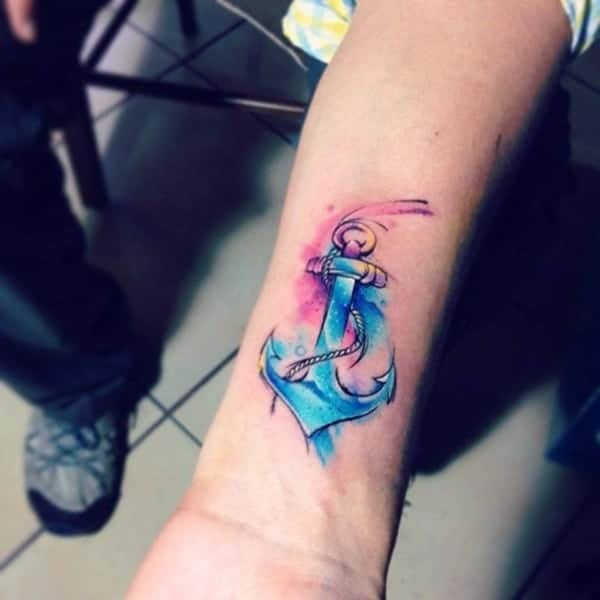 This is an inspiring and relaxing tattoo design. 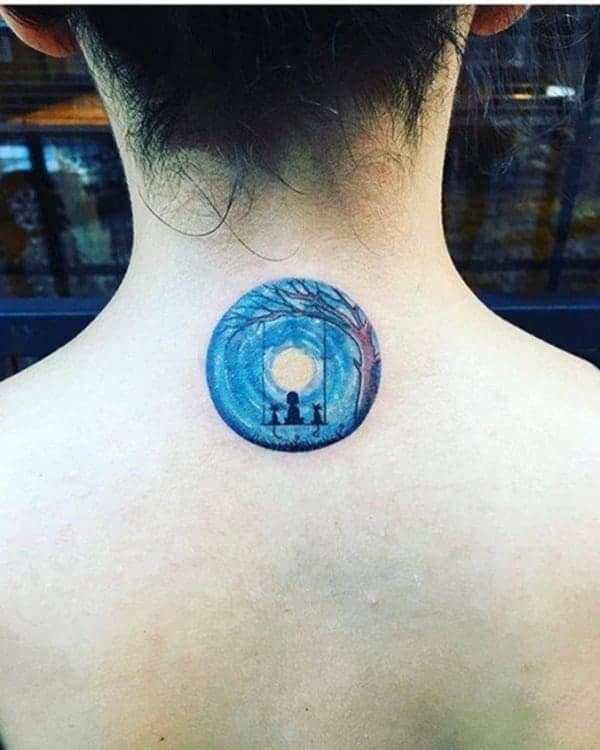 A tattoo that is sure to bring you good memories. 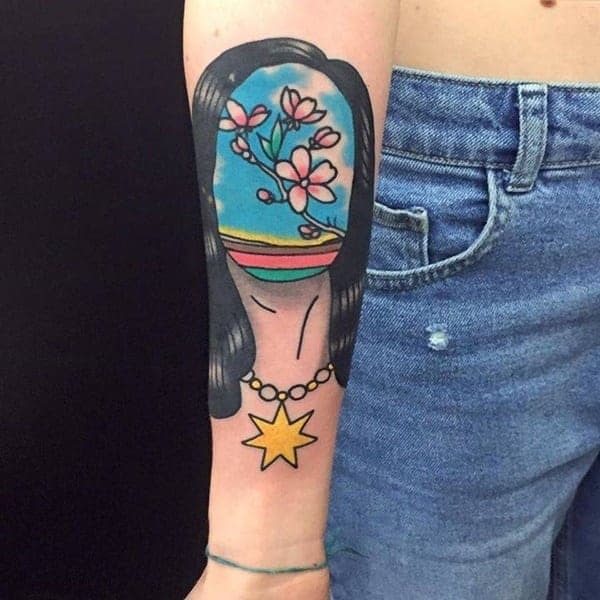 A stunning tattoo design like this is sure to bring a smile to your face. The landscape is so realistic and beautiful. 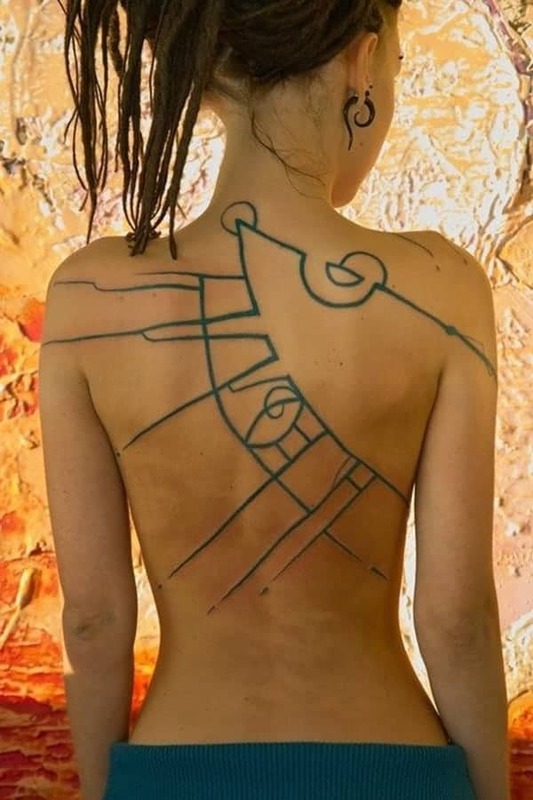 Geometric tattoos come in all shapes and sizes. This could easily be a scene out of the movie IT. These are sweet styles that show off your love. 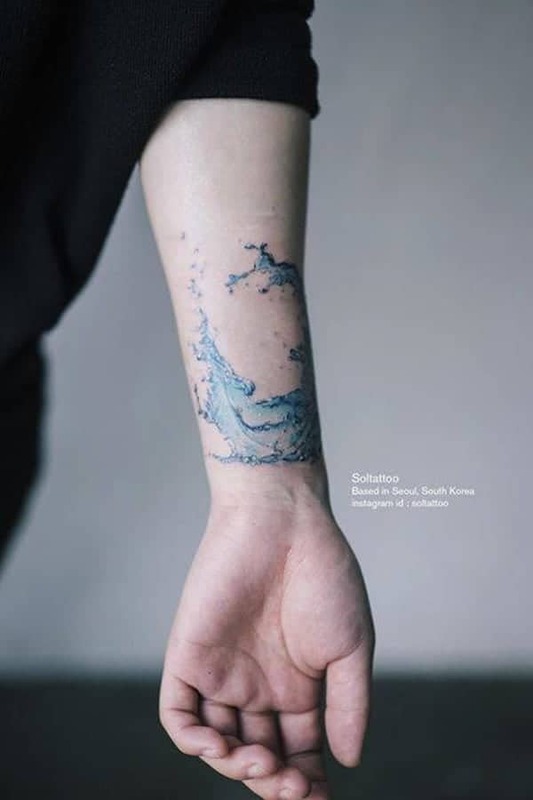 This water tattoo is so realistic that you can practically feel the coolness of the water. Purple and blue go so well together. A stunning floral design without outlines will create a softer look. 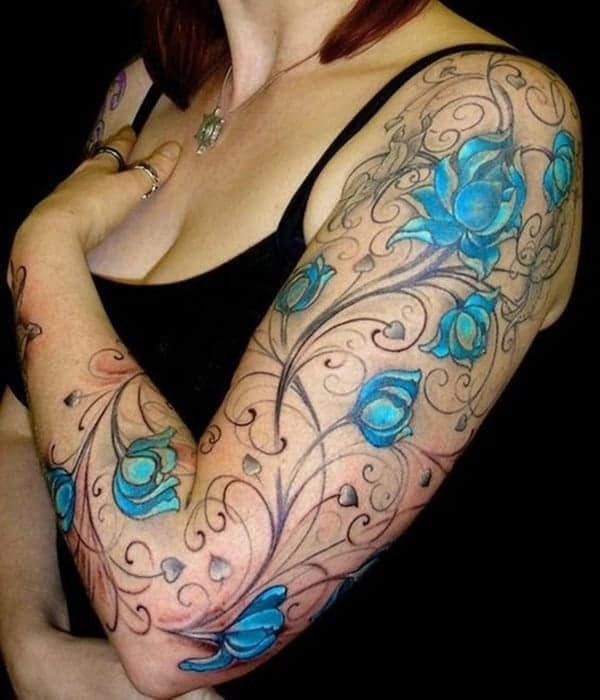 A style like this is sure to please you because of the amazing shading involved. This is a cool looking image that probably has a lot of meaning to it. 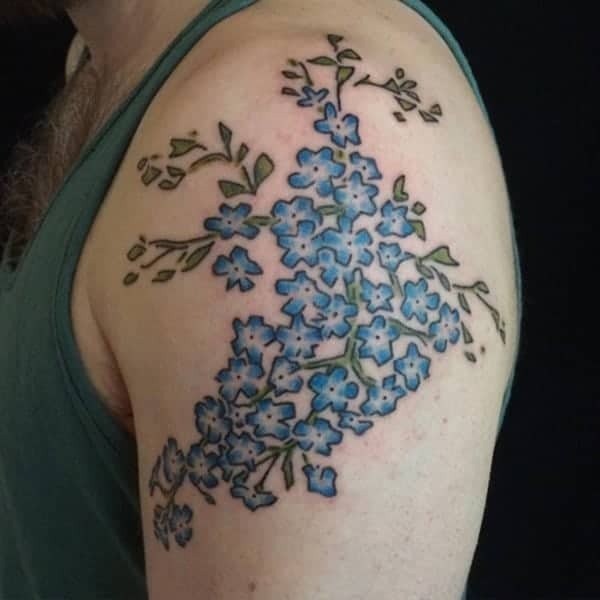 Another great floral design that has some pretty blue colors. 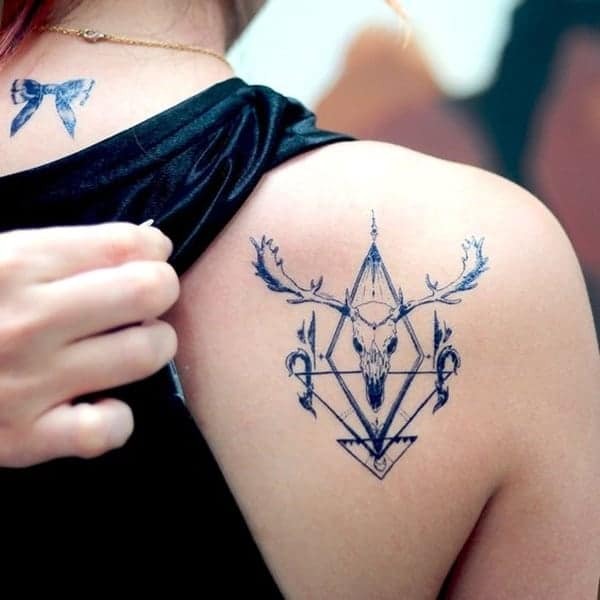 If you want a cool shoulder tattoo, this is a great image to have.